I was really hoping that I would get some nice sunny and warm weather when I got to Vietnam. It wasn’t to be today. I woke up to the sound of rain. Also wasn’t feeling 100 percent. So I didn’t need much to persuade me to stay another night. I was starving and looking for some nice yummy food to eat. I walked into the centre of town and found a five star hotel where I went for brunch. The menu was extensive…………and snake looked popular. But I just settled for a BLT sandwich and a banana pancake. I was so happy because I just couldn’t face noodles. After brunch I went and got a shave. 20000 dong was pretty cheap. Though when I went to pay it was 30000. Soon after I went and brought a drink………10000 dong. But when I got the change it was 12000. I have very quickly started to see a trend here…………………..and its not my loss of hearing. 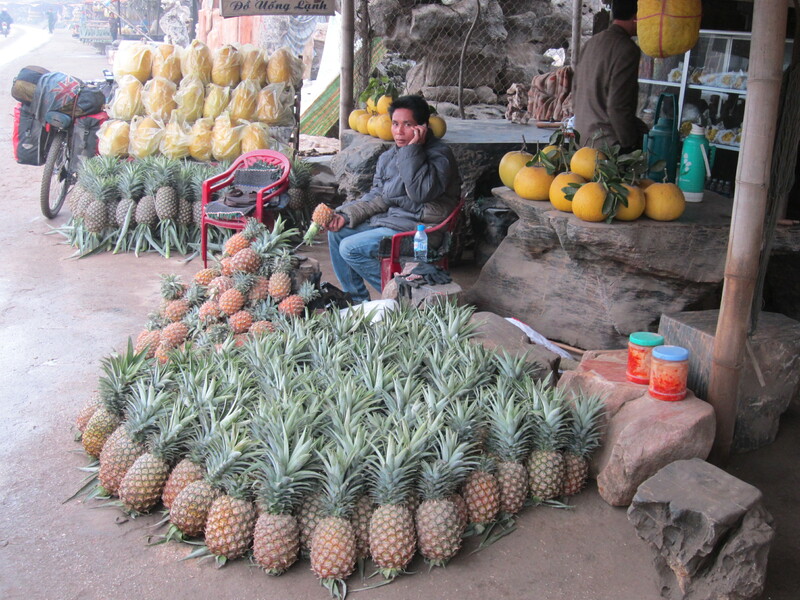 The fruit stalls in the street were selling fresh pineapple. For 5000 dong (15p) they would cut it for you in such a way you could then just eat it with ease. The problem with the hotel was it was a little out of town. I couldn’t be bothered going back to the 5 star hotel for dinner so I just went out on the street. Sadly, I don’t think my stomach was ready for it. There was limited choice and I had some goat meat, fried cheese and some green stuff. It didn’t help with my recovery because in the morning I felt worse. Already the French influence is evident in the style of buildings, churches and bread. I just want to get to Hanoi now. It’s about 350 km away. My stomach is still a bit rough. I left on highway 70 on a damp wet cold day. For breakfast I had some very boring 2 minute noodles to get me started. It wasn’t long before I started to pass a few pineapple vendors so grabbed a lovely fresh pineapple for later. Cycling I just had no energy. I think I was still a bit dehydrated and any real exertion got my stomach churning. I was happy to cycle slowly because I was constantly taking in the surrounding activity and scenery. There are always chickens running around, a few dogs, water buffalo and children as well as the locals tending the fields. In the end I had to stop early. I didn’t fancy the tent. £4.50 for a basic hotel room with internet………….I tried to find somewhere to eat. Ended up having noodlessssssssssss again. They were hard to stomach. The local shops had nothing very nice……usually not very nice biscuits and other rubbish. The scenery continued to be beautiful and I could imagine how much more beautiful it would be if it was a little warmer and the sun was beaming. Cycling in the rain is depressing. I again just plodded along with my churning stomach. Lunch time I stopped at a small shop where they were cooking fresh corn on the cob. I stopped to rest and sat and had a few pieces before moving on. It was very tasty and just what my stomach needed. At 4 p.m. I stopped at the first hotel I saw. It was a large hotel with swimming pool and large white marble statues everywhere. But it was completely dead. I have a magic number 150000 dong. When negations broke down. I upped and left. I didn’t have to go far before I was called back and magic number had been agreed on. For £4.70 it was only a basic room, with hot shower, toilet and TV and WIFI. So not too bad. 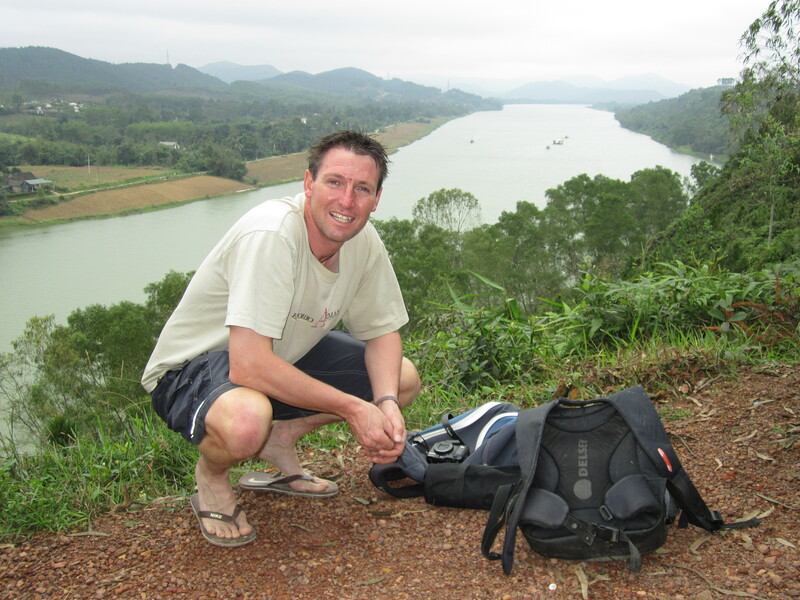 Bit of the same old same old……………..
lunch was nice sitting with locals eating baked potatoes and I then continued to plod on my way slowly getting closer and closer to Hanoi. I can’t wait to get there. I went for an early start to make sure I gave myself plenty of time to get to Hanoi. But before I even got on the bike, the back tyre was as flat as a pancake. It was the standard thin bit of wire from a truck blowout. It was wet and damp and it wasn’t long before the bike and I were completely filthy. It was completely built up all the way into Hanoi. A lot more traffic than I had experienced for a while. One good thing it was downhill. Around lunch time I stopped for fresh corn on the cob at one of the many little vendors on the side of the road. 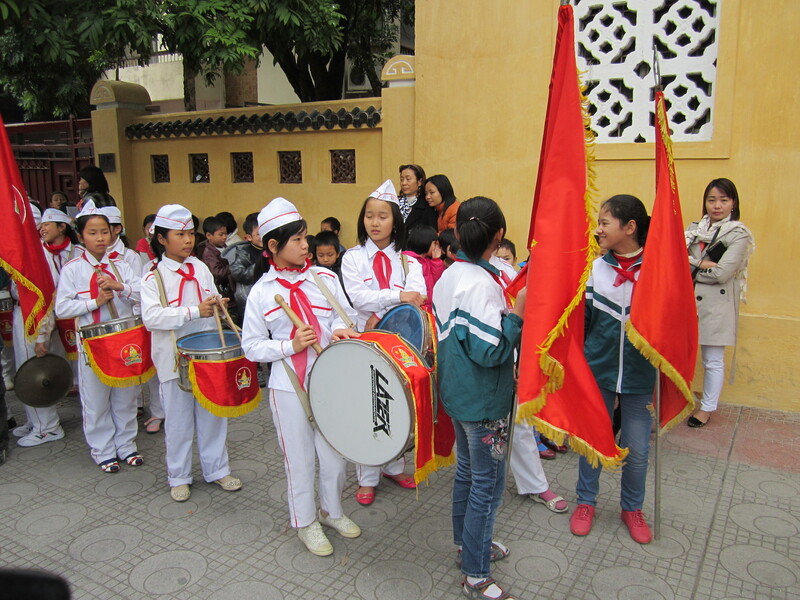 About 2pm, I was very happy to be on the outskirts of Hanoi. It was pretty exciting cycling through the city in heavy traffic. You had to have your wits about you with traffic coming from every direction. Finding the hostel was pretty easy for a change. The first thing was to get some washing done and the next thing was to go to the supermarket. After the supermarket I decided to do a lap around the lake which was nicely lit with many lanterns hanging from the trees. I knew Vietnam might be a problem for theft and I was right. I had a guy come up to me and try and sell me some books as he did so he kept nudging me. Being a seasoned traveller I should have seen it coming. While he was nudging me, he must have nicked my camera out of my jacket pocket. I never realized until later when I went to take a photo and the penny dropped. I knew straightaway what had happened. I’m just glad it wasn’t my wallet or passport. In the end he did me a favour because I was going to buy a new camera any way because the zoom didn’t work it was falling to bits. Its just a shame I lost all my photos from the last 4 days coming down from Lao Cai. 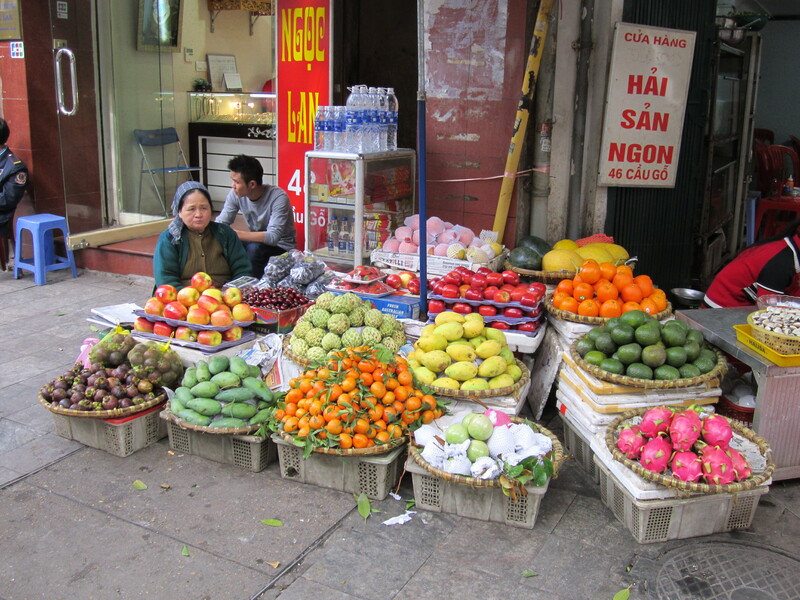 Day 283: Hanoi is so touristy. Yesterday afternoon it seemed like I saw more tourists in such a short time than the whole of my trip. Two priorities today were to get the Thai visa and to buy a new camera. Both proved to be pretty easy. The embassy was only a 20 min walk from the hostel. $40.00 pick it up tomorrow. I then went and checked the camera shops. Looked at a few cameras and then went back to the hostels to check them out on the internet before going back to buy a Canon power shot A2200. Hopefully I have made a good decision for £100. After the hard work was done, it was time to eat………….I couldn’t help myself Burger and chips. I made up for it in the evening by eating off the street. Found a bakery on the way back to the hostel which had awesome Lamingtons. Day 284: Did the hostel walking tour in the morning which was quite good and finished sitting on the roof of a café drinking coffee while overlooking the lake. Then with one of the girls from the walking tour Cristina we walked up to the literary temple which is the nicest temple in Hanoi. Afterwards we went and explored the old citadel. On the way back I got a shave and hair cut from a guy who had just set up on a street corner on the side of the street. It was a good shave. He did well………..but again the first price and end price were different. 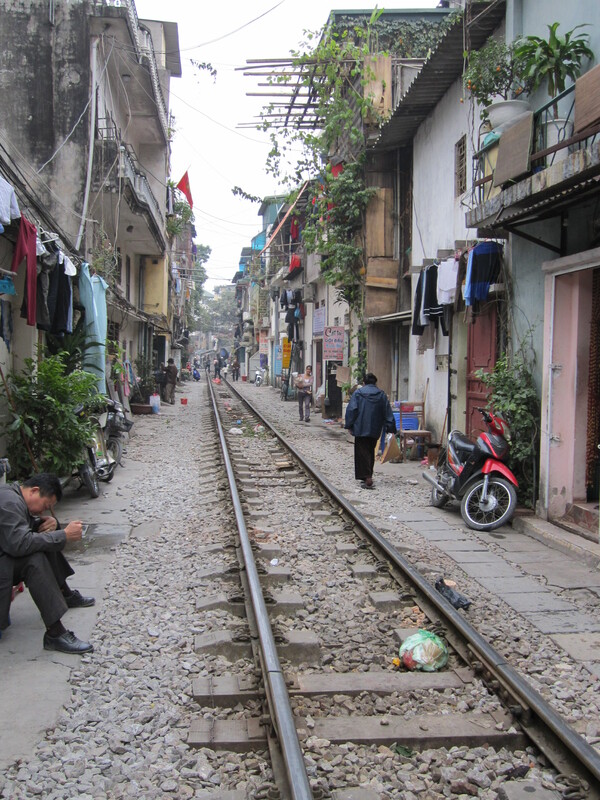 The most interesting part of our walk was following the railway line and seeing the everyday life of the people whose houses open onto the tracks. Day 285: Went straight to the Ho Chi Minh Mausoleum to get a 15 second glimpse of his preserved body in a glass case………….40 years on. It is very propaganda. Smartly dressed school kids marching and singing come to pay their respects. 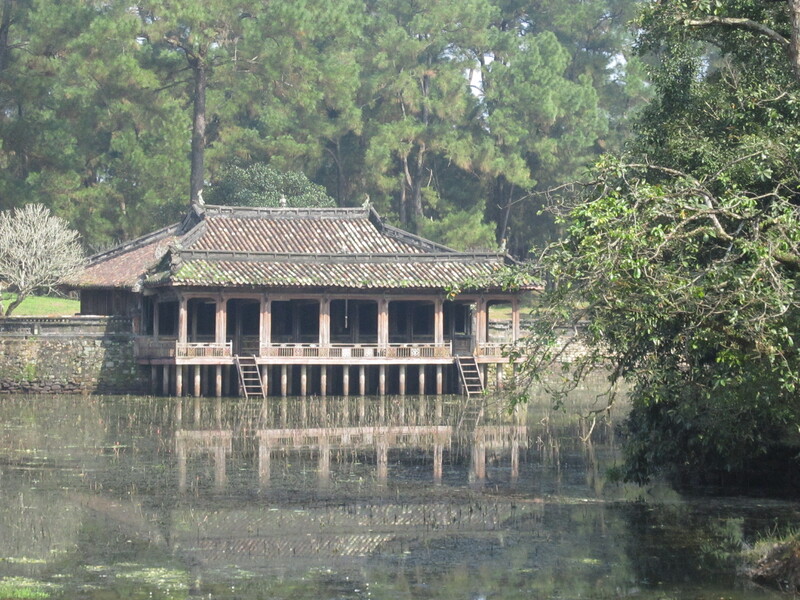 Afterwards I visited the palace and Stilt house where Ho spent his last years. The botanical gardens were close so I checked them out too. Just a large park really with lots of trees and a lake. Not many flowers. 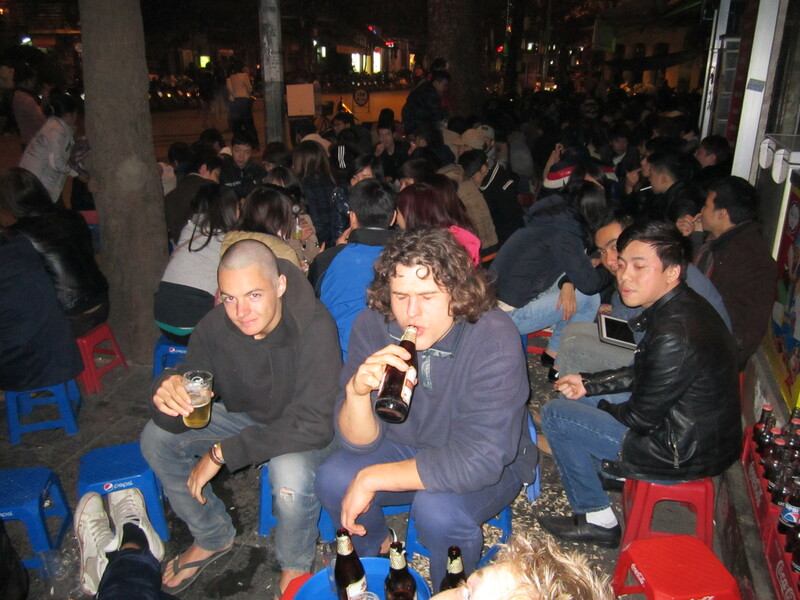 In the evening, I went to the local for some food and a few beers with a Dutch, a Swiss and a German guy. Day 286: I spent a bit of the morning planning where I will go in Vietnam. I’m getting excited. Some nice things lay ahead. I then headed to the National History Museum because I heard it was free. Turned out you had to pay. 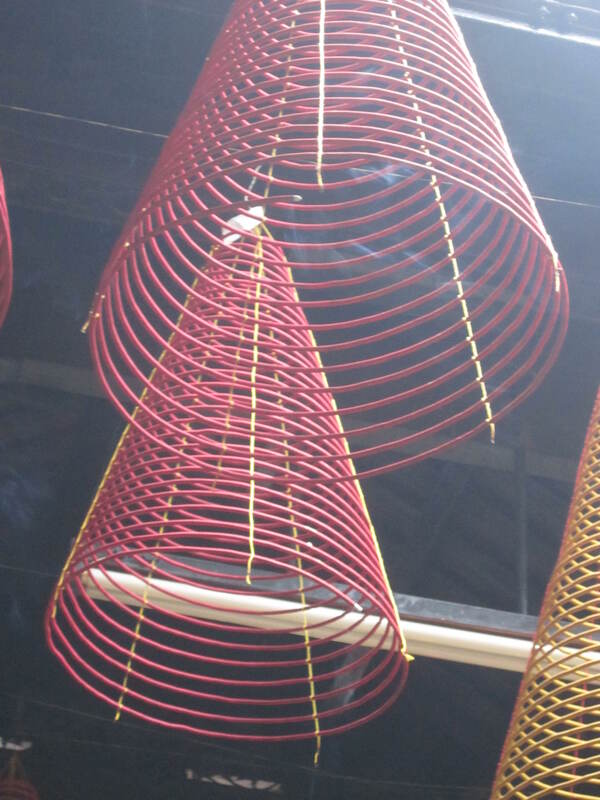 But it was good………and interesting because Vietnam culture has a different style from China and other parts of Asia. 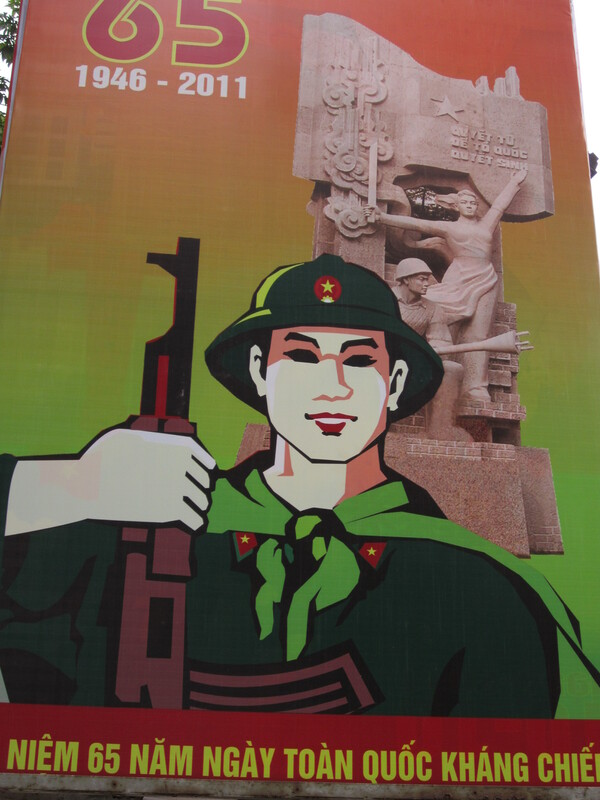 I then stumbled upon the revolution museum which was free……..probably to encourage as many tourists to visit a museum full of propaganda. 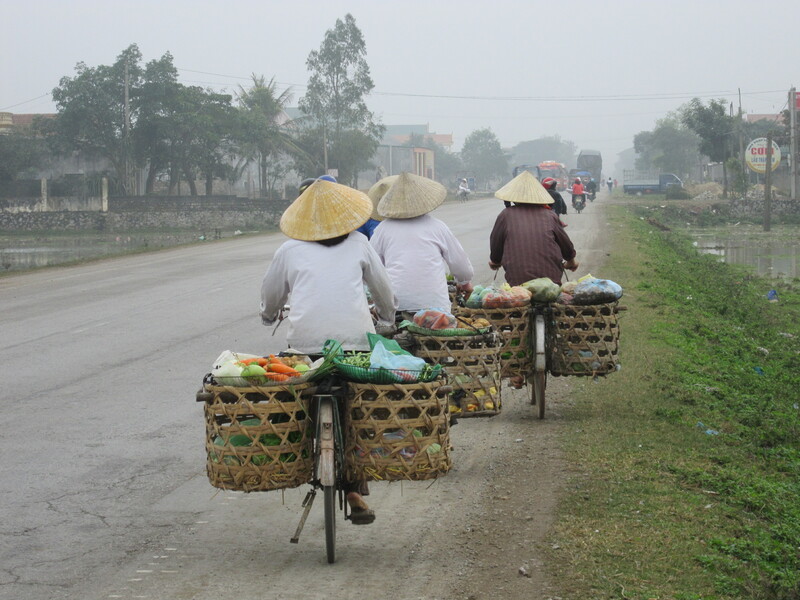 It was surprisingly easy cycling out of Hanoi this sunless morning. I found the QL 1 heading south and on a good flat road. 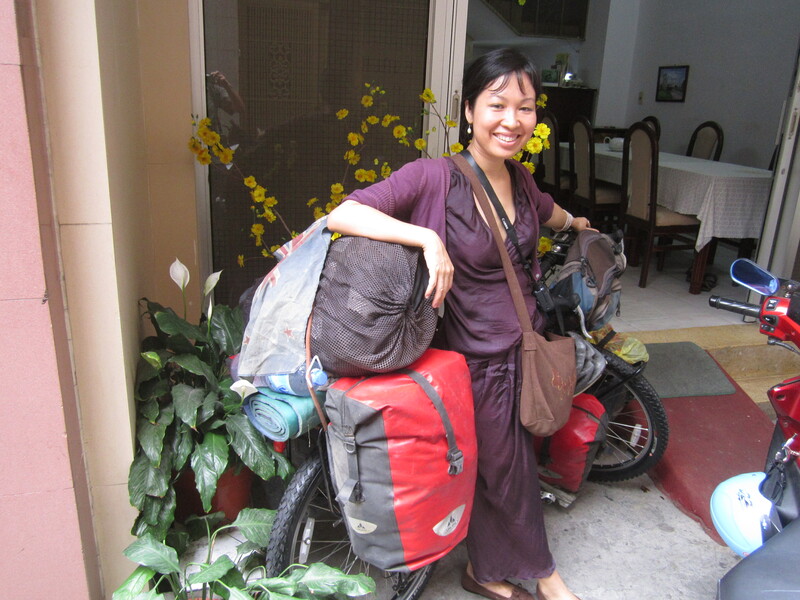 I made some changes to the bike in Hanoi and could feel the benefits straightaway. I took off the very heavy £3.50 Chinese tyre and swapped it with my fold up emergency tyre………which I have had to use twice before. The Chinese tyre is now the emergency tyre. I was flying for the first time in a long time and it was great. 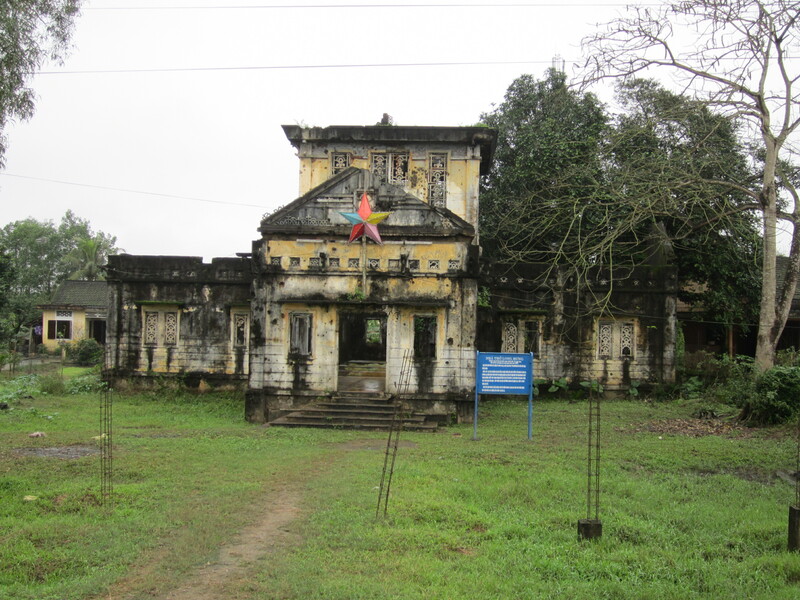 I was in Nionh Binh just after lunch. This was good because it gave me the afternoon to visit the nearby Tam Cot caves. The hotel was insistent that I hire a motorbike to take me the 8 km. 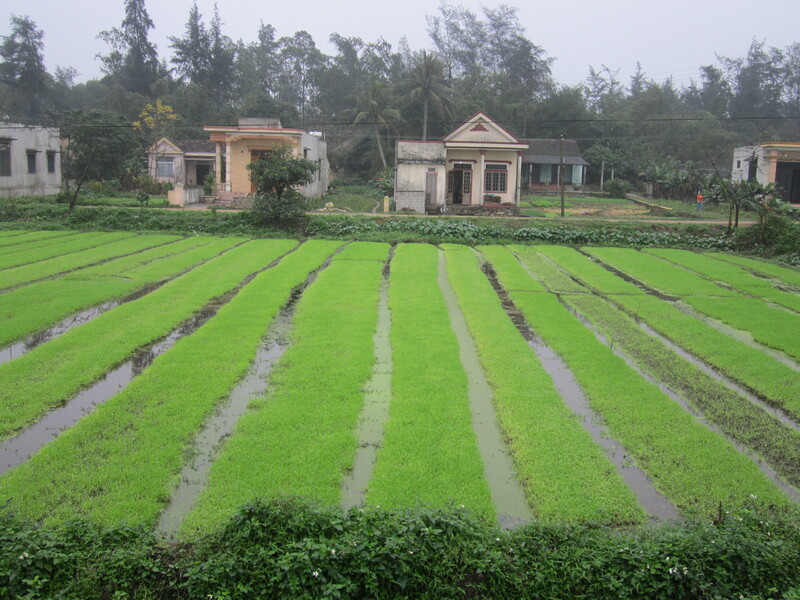 I was happy to walk along the rice fields and in and out of the little villages. 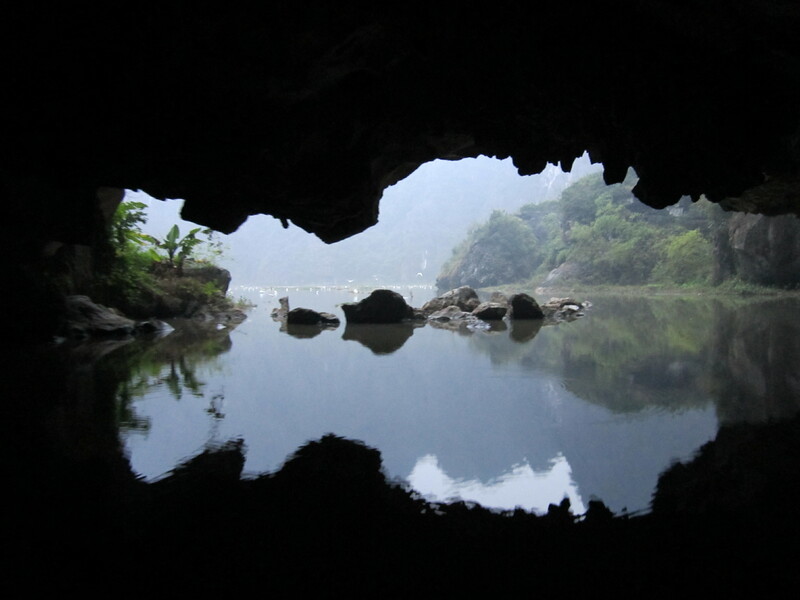 To visit the caves you need to hire a boat. You then go 7 km passing through 3 caves along the way. The boats are all paddled by women who cleverly use their feet. The Vietnamese must all take a degree in creative accounting. The boat trip was 110 000 dong. I handed over 200 000 to the lady at the kiosk and watched her whisk the money into a drawer. She then made up the ticket and then asked me for 110 000. I sternly replied no I’m waiting for my 90 000 change…………you put my money in the drawer…………….I got my change. But I am sick of the locals trying it on every day. Up till now I have been lucky for the last 9 months I haven’t had this hassle. There are always people about in the fields working, cycling along, with their carts or on their motorbikes. 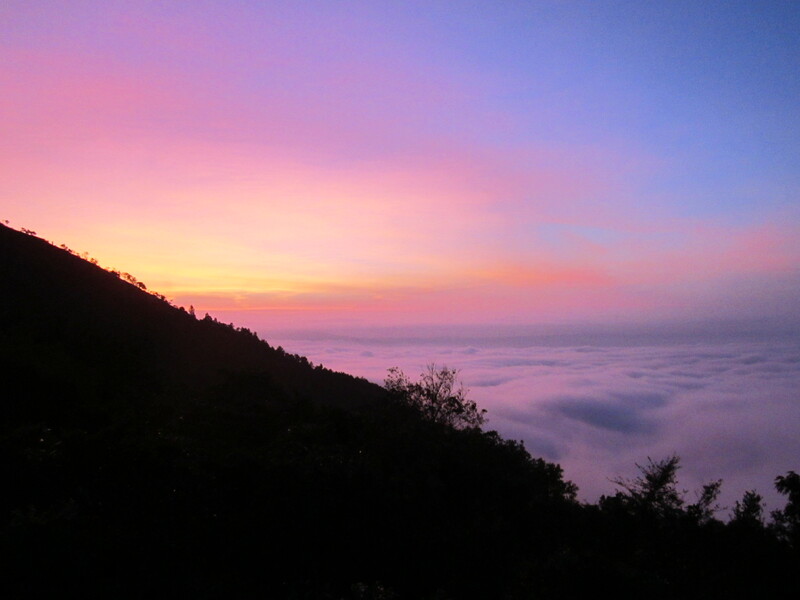 The land is flat and there are rice fields for as far as the eye can see………….or that the mist and fog will allow. I have been cycling very close to the ocean. I can smell the sea salt. But as yet with the fog I have not seen the ocean yet. I am very excited for when that day will come. It has been more than 6 months since I last saw the ocean and its waves in Turkey. What a way to start the day. Not for the first time I have gone to cycle off and found I have a puncture. The back tyre was as flat as a pancake. Then in my haste to get going I took off in the wrong direction. After 3 km I thought things were looking a bit familiar. I went on for another 2km before I finally convinced myself to turn around. So the first hour of the day was a complete loss and the first 10 km took me nowhere. In the end I did make up for it with a good cycling day of 131 km. In the late afternoon I got a first for Vietnam when the sun finally came out for an hour. Definitely one great advantage of, cycling is that I am always cycling through little towns and having time to peer down always to see just a little bit more than your average tourist speeding through on the bus. The real highlight for today was the fog lifting and the ocean appearing……..as soon as I saw it I took the next available track down to the beach. I dipped my hand and the water was quite warm. The beach was very nice and I was well keen to stop for the day and camp on the beach for the night. But it was too early in the day and I had to cycle on. Again I am in a hurry to get to Hue and apply for a visa extension before the 9 day Vietnamese New Year holiday. Every time I get a hotel they always put you on the top floor. You may think that’s good. It would be if the hotel had a lift………most don’t. So it’s a real hassle lugging everything up and down. The annoying thing is most of the time the hotel is empty anyway…………..so this evening when the woman was taking me up to the room and we were on the second floor and about to head to the third……………..I said stop right there I’m not going up any more floors and explained I would be staying on a lower floor or I would be leaving. On this occasion she agreed. Most of the others just blatantly lie to you and say the lower rooms are all taken……..when they are clearly not. Today I technically crossed over from North Vietnam to Southern Vietnam when I cycled over the bridge on the 17th parallel in the middle of the DMZ. This is the area that use to divide Vietnam. I crossed on the skinny old planked wooden bridge only to find when I got to the other side it was blocked so I had to go back and cross on the new bridge. At 3pm I had done 100 km and now had less the 100 km to get to Hue tomorrow. I negotiated a good price for the room and got myself down from the 5th to the 3rd floor…..but in the end I had to walk away because they insisted they needed to hold my passport. I told them that wasn’t going to happen and they could have my driver’s license. That wasn’t good enough for them so I left. In the end they did me a favour because I was able to push on and do another 30 km to Dong Ha and it left me a good run into Hue tomorrow. Since Dang Ha was a big city there were lots of hotels and it was easy to negotiate. Surprise, surprise it was another wet morning when I set off. The roads were muddy and it wasn’t long before I was filthy. 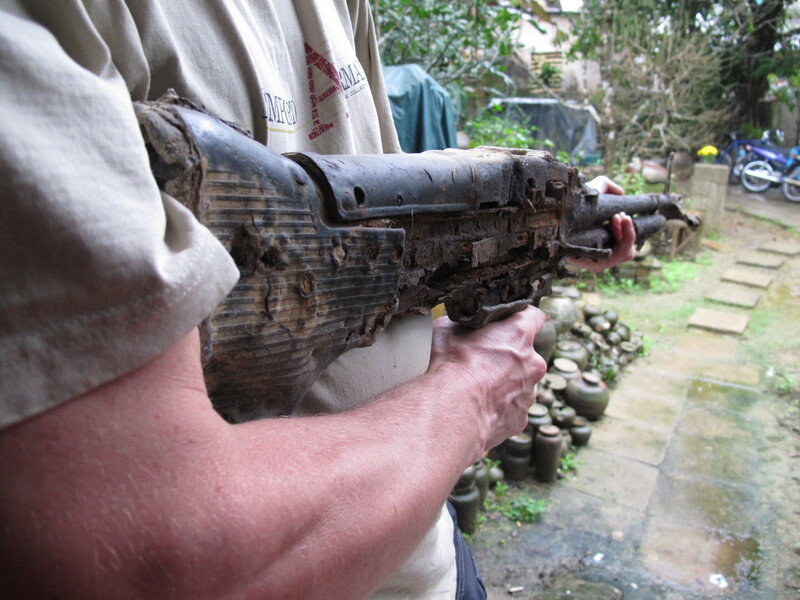 There are a lot of relics left over from the Vietnam war. From the road I spotted some bunkers beside a cemetery so I went for a look. In front of the bunkers were the old trenches. Continuing on 20 km I then found a ruined church beside the road that was riddled with bullet holes from a fierce battle. The cycling got a little harder with a bit of a headwind and it became a bit muggy. 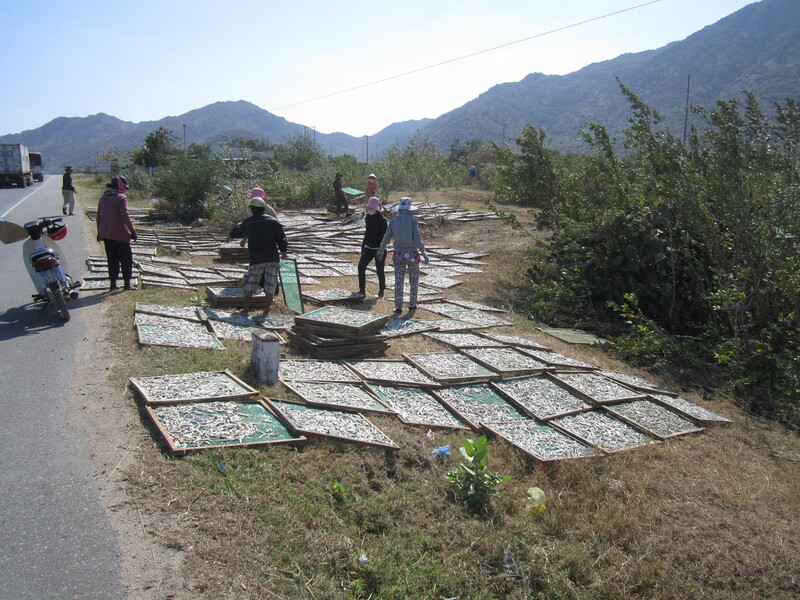 13 km from Hue I passed a bakery and did an instant U turn. I was hungry and in a touristy mood. I got them to make up a couple of baguettes with meat and salad and I grabbed a couple of cakes as well. They let me sit behind the counter and eat my lunch. They brought me water. A small vendor selling raw sugar cane stopped outside the bakery and one of the girls went out and brought 20 small sticks. We then sat and chewed sugar cane…….it was very sweet, very juicy and quite refreshing. Cycling into Hue it was bang……………like Hanoi with tourists everywhere. I checked into the only hostel in town and then hot-footed it round to the immigration office for a visa extension. Visa runs out in 4 days time. I was asked if I had a sponsor………….and was told I could only stay in the country if I had a company to sponsor me..Thats no good. I obviously didn’t and what they were saying was rubbish. I was then told very bluntly and not subtle at all that if I paid 1000000 Dong and waited 30 minutes my passsport would come back with a new visa. I said I only have 800 000. It was ok 800000 and US$10.00………….It was pure blackmail and I paid the US$50.00 for a $10.00 visa. It sums up Vietnam and I left with a bitter taste in my mouth………….I am starting to wonder why I actually went out of my way to come here because initially I was going to go the quick route: China, Lao, Thailand. For the first time on this trip I used couch surfing. When I was in Dong Ha I sent a message to a local. I ended up meeting Lan tonight and we went for dinner in a very good local restaurant and it was great to get some local knowledge. 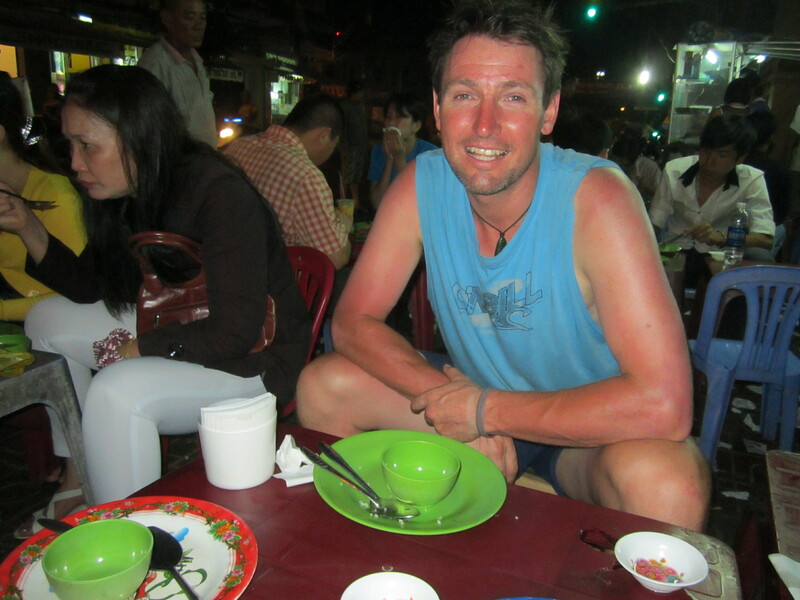 Hue is just full of tourists…………………..I feel a little ashamed walking around in my rags…………….after 9 months I have absolutely no clean clothes………….even a good wash doesn’t get all the stains out……….and certainly doesn’t mend the rips and holes……………….. I had to take my cycling shorts to the seamstress……………….they will last at least another month. My bike and all my panniers were completely covered in mud………………..I washed the panniers in the shower and the cleaners went mad when they caught me………………I took the bike to a motorbike wash for a polish and clean……………money well spent. 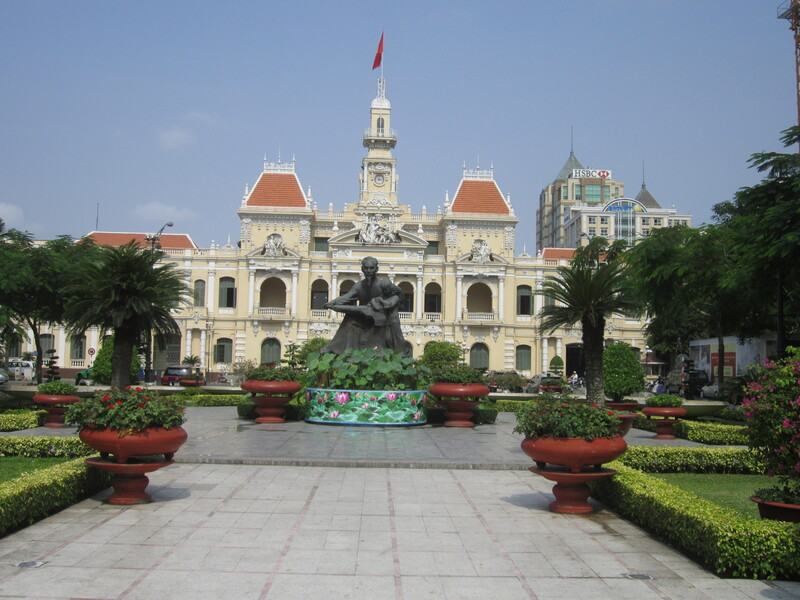 Day 294: The great thing about Vietnam being an ex-French colony……….apart from the French bread and colonial buildings is that there is never any surprises because there is always a western style toilet…………….Its a small world. Last night when I was having dinner I ran into a French girl Ediane who I had met twice months back in China in Chendu and Emishan. We ended up spending half a day visiting the citadel. Day 295: Another rest day. 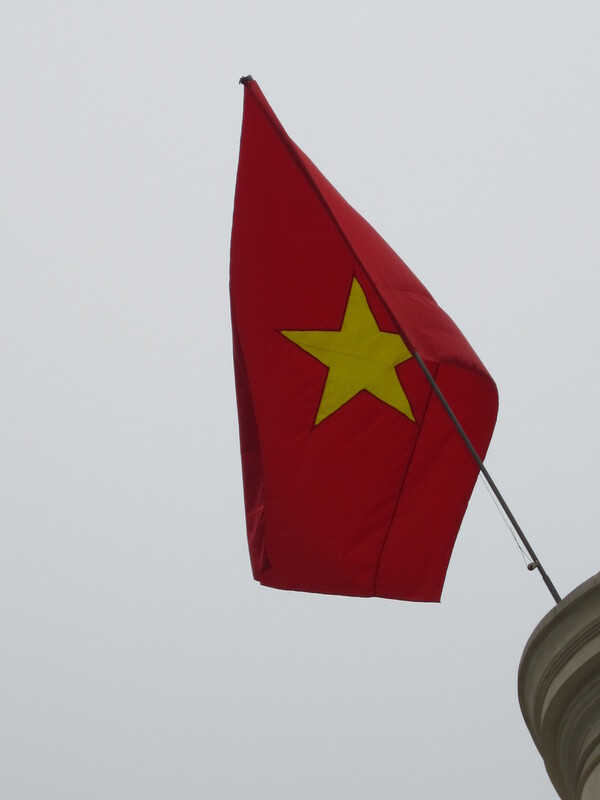 I am staying put till after the Vietnamese New Year. I caught up again with Lan a local girl who I met through couch surfing and with our bikes we cycled out of Hue to visit some pagodas and King’s tombs. First things first we went to a great little local place for breakfast. No good cycling on an empty stomach. When we did get going our first stop was a pagoda, a little off the main road. I would have never found it on my own. It was boastful with a little lake full of fish and turtles. The sun was out which also made it very nice…………..we saw some tombs that told a chilling story. They were the tombs of the male workers that worked in the palace……….They were quite something because to work in the palace they had to get the big chop so as they couldn’t play with any of the Kings’ wives……………….Not a job I would want. Second stop was the Kings’ tombs which weren’t impressive but everything else around it was. 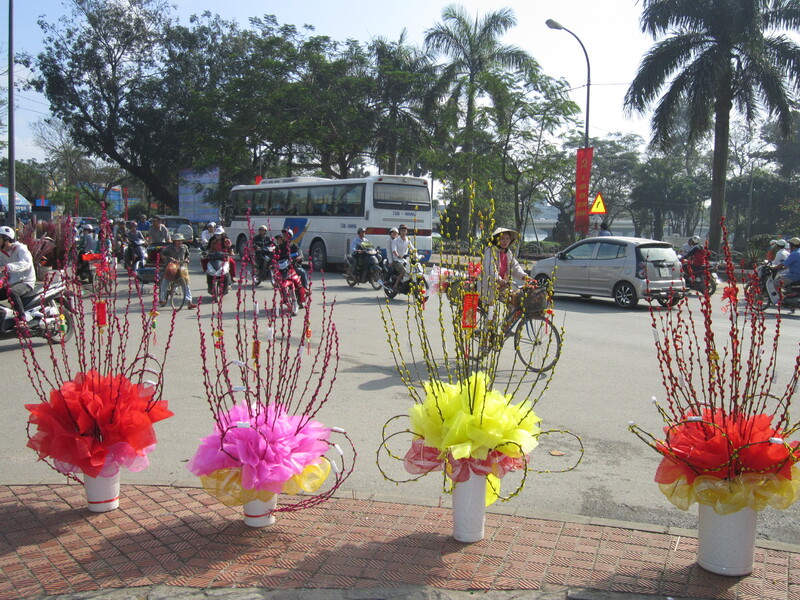 With the New Year (Vietnam) fast approaching the locals are going all out. The market is pure mayhem. With the New Year there is lots happening. Last night when I was crossing back over the bridge there were 50 candles floating down the river. 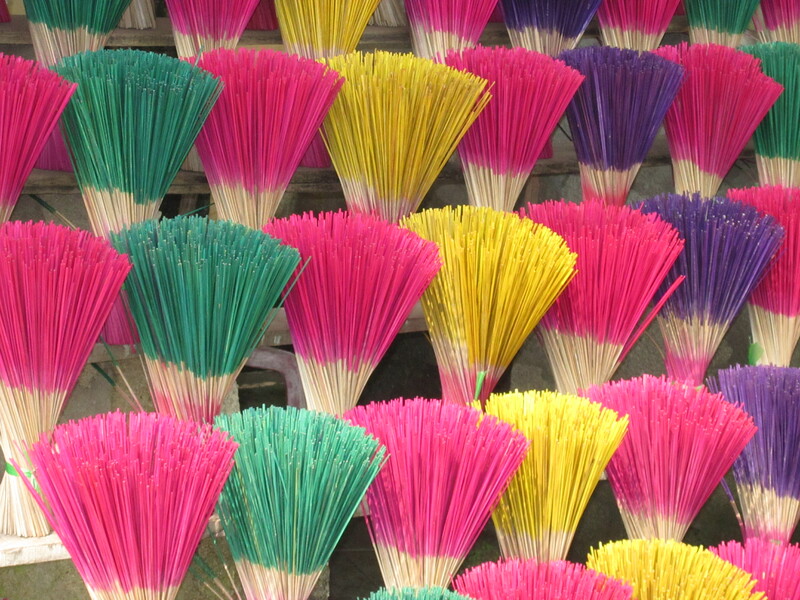 Day 296: The Vietnamese New Year is the biggest holiday in Vietnam. Everything shuts down while everyone returns to spend time with their family. Wherever you are today is where you will be staying for the next 3 days because there is no public transport……………and a lack of accommodation because they close as well. By early afternoon the place was a ghost town. With everything shut…………..I left it late but I did find somewhere to get a shave……………..though no New Year’s kissing here in Vietnam…………….I’ll be ready anyway. Just in case. For the first time after many shaves on the street she cut me………..luckily not too bad. I got invited tonight to have dinner with Lan who I met through couch surfing, her mum, and two friends. I went the 4 km on my bike in the rain. Her mum had prepared some lovely traditional food. I had mentioned I loved bananas so her mum very kindly had got a big bunch for me. During dinner I mentioned I really like ginger so I got to take a small bag home as well. A custom here in Vietnam is to give lucky money. Bringing good luck to both the person giving and receiving. I stayed for about 3 hours before I had to cycle back to the hostel. It had been raining hard and a lot. Some of the roads were flooded. 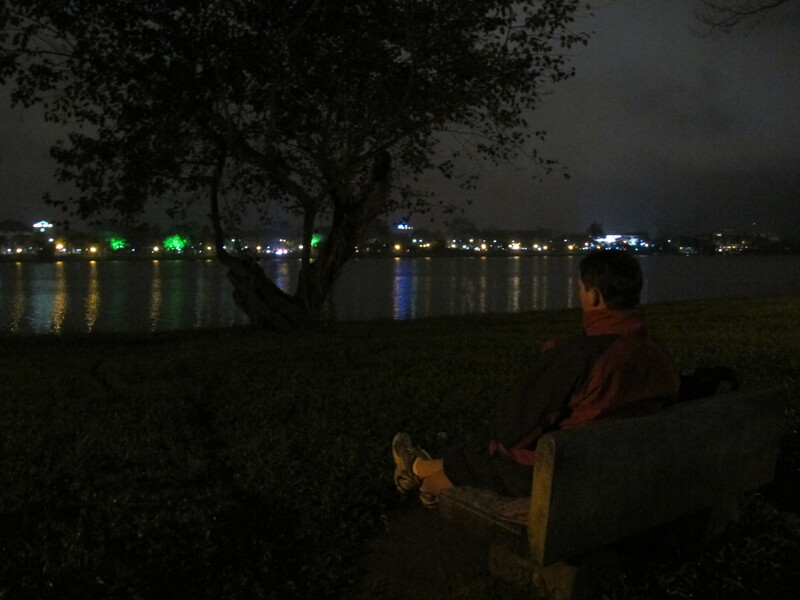 I had been looking forward since I arrived in Hue for the New Year’s fireworks and celebrations on the river bank. I waited till 10:30pm and then braved the weather heading back out and across the river. It was still raining……………and a bit cold. I thought of London. When I reached the stage just inside the citadel there were a lot of people. 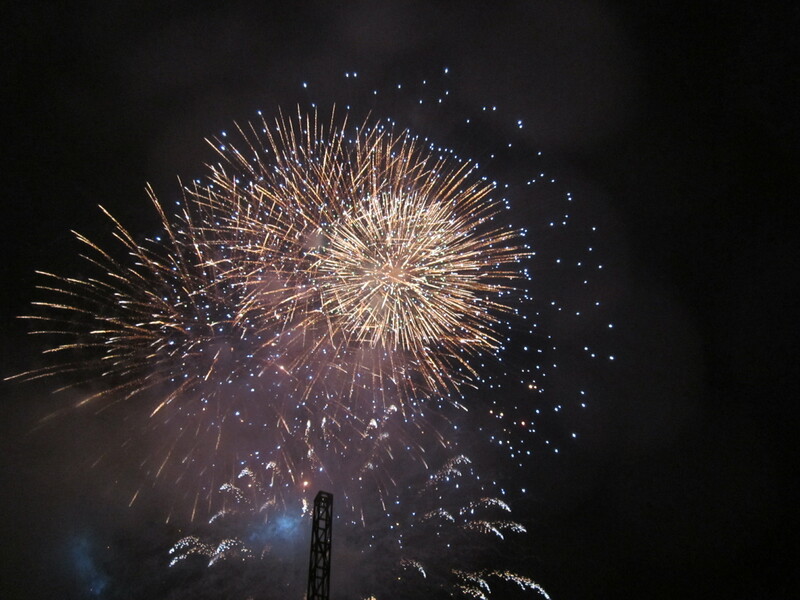 I really enjoyed the traditional performances and at midnight we had a 15min fireworks display. Day 297: Happy New Year Vietnam. At midday I went back to Lan’s house for lunch and because I said I liked fried potato…………there was extra. After lunch I cycled and Lan took her motorbike and we went and visited her ex-history teacher and archeologist whose house is just fill of interesting artifacts. Many of which he has pulled out of the local river. Some things dated back 1500 years……………more recently he had a machine gun and a pistol from the Vietnam war. We spent a good two hours drinking tea and looking at interesting objects. It was a very nice afternoon. Day 298 : I met my own personal local guide, Lan, who took me out to the country to visit the not so touristic Kings’ tombs……………a little run down. But that’s what makes them so nice. Afterwards we cycled up to the top of a hill which had a few bunkers and nice views overlooking the river. Like everywhere, during New Year the Vietnamese eat a lot. For lunch we went to one of Lan’s friends where we had 11 different dishes to try. Day 299: After a week in Hue I really need to get going…………….but I am not going anywhere today. The weather is miserable and I don’t fancy it. 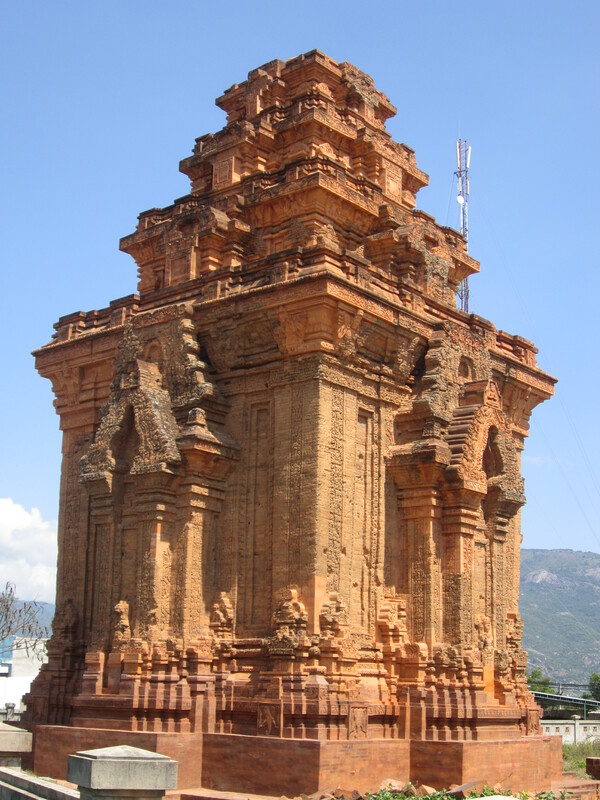 So tomorrow it will be………rain or shine – 150 km to the ancient city of Hoi An. I actually enjoyed hanging around the hostel doing nothing after being kept busy sight-seeing with my couch surfing friend, Lan. I did make it out of the hostel for a few hours to go with Lan to a birthday party of one of her friends. There was some yummy food and the Heineken beer made a nice change from the local brew. To finish off the day we walked back along the river bank which was nicely lit and very pretty. I wanted to have a good day today to make up for yesterday’s extra day in Hue. So I was up at 5:30 a.m. and shortly later loading the bike. I made the most of the hostel’s free breakfast. Said goodbye to the friendly hostel staff who I had built up a good rapport with over the last week. 7 a.m. I was on the road………thankfully it was dry. After some dodgy directions I got a little lost leaving Hue and found I was heading North not South. By the time I found the right road it was nearly 8a.m. and I had lost the edge. After lunch I started to climb the 500 meter Hai Van pass. It wasn’t too bad a climb and gave a nice view of the coast. I could smell incense burning from many of the small shrines beside the road. As I got higher I disappeared into a thick mist. 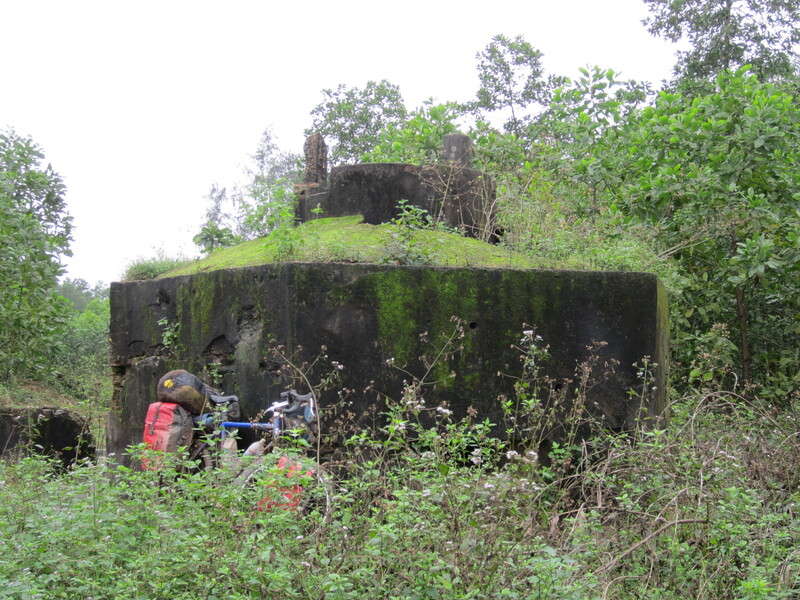 The first thing I saw when I reached the top of the pass was the old French fort and American bunkers that were part of a base in the Vietnam war. I was then set upon by some aggressive sellers. I was polite for 2 mins and then I told them where to go. I took a track off the main road that took me up to the top of the old base and away from the tourists. I found a great spot on a nice green patch with a bit of bush between some old bunkers. Looking around I found some old tunnels. When the mist cleared I had a fantastic view to the south looking down into the bay and to the north I was looking down onto a sea of cloud. It was a bit airy with the mist rolling in and out. The lower bunkers were riddled with bullet holes from an attack on the base…………I could imagine at night it wouldn’t have been much fun up here waiting to be attacked. There was a little rain overnight. The mist had cleared. But I couldn’t see the water in the bay because it was covered by a sea of cloud. I climbed on top of one of the bunkers and watched the sun come up. It’s a rarity in Vietnam so I made the most of it. Went to cycle off and discovered I had a puncture. I pumped the tyre and thought I’d see how far I would get. Not far…………a couple of km and it was down again………fixed it and I was on my way………No, I hadn’t fix it because 1 km later it was flat again. This time I changed the tube and it was as good as gold. I continued down the mountain in a thick mist. Near the bottom I came out of the mist and was overlooking a beautiful golden sand beach. In just a couple of hours the mist and cloud lifted and it became a hot and muggy day. 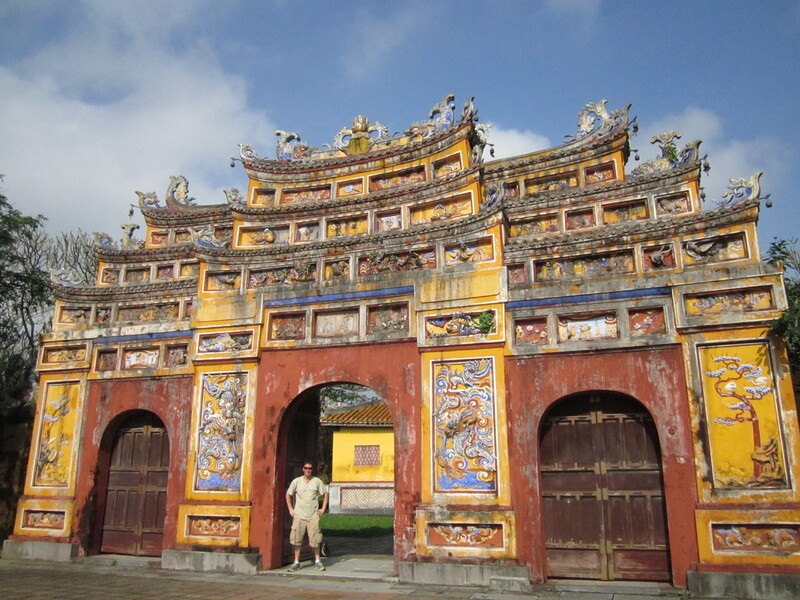 I cycled straight through Vietnam’s 3rd largest city Da Nang and along the coast passing marble mountain to Hai An. There were loads of resorts along the way. 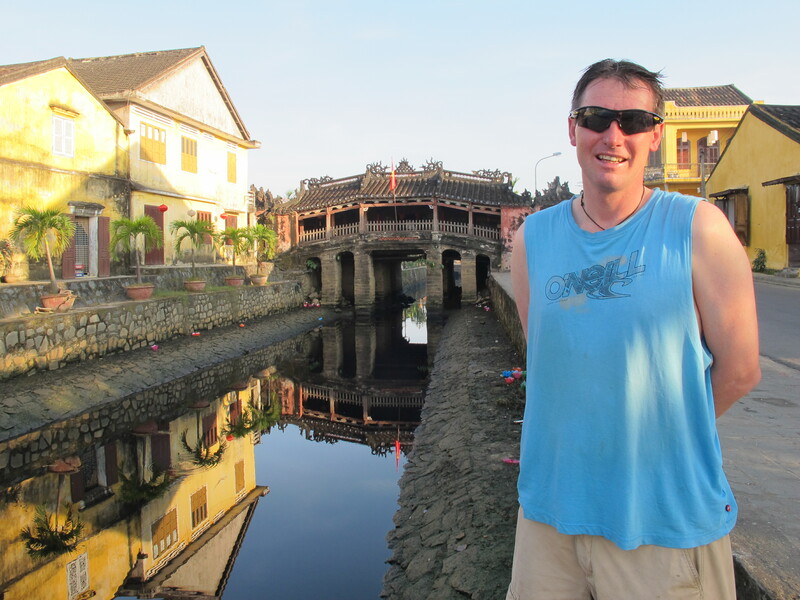 Hoi An……is very touristy and the price of the hotel is double what I normally pay and it is not even that nice. In the afternoon I had a walk around the old town. Western food for lunch and local food for dinner. I got up early and took a walk into the old town to take some photos. 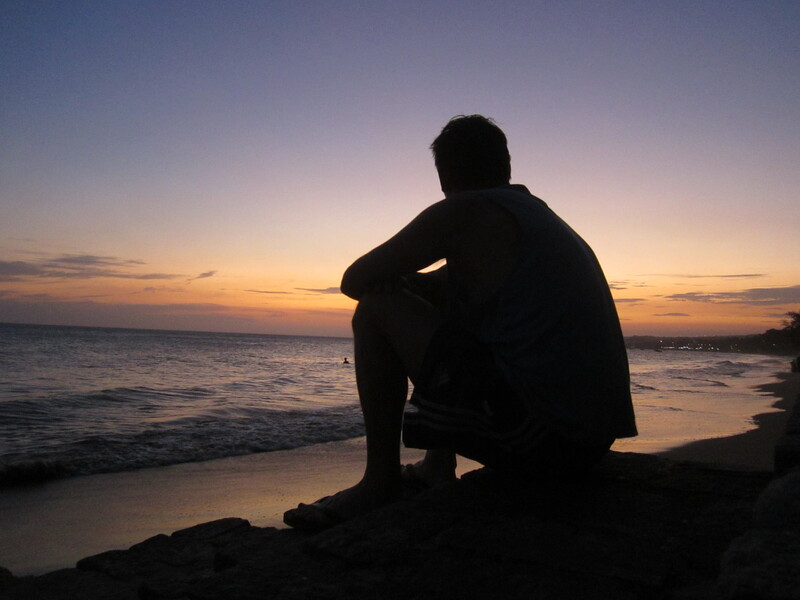 It was great because there were no tourists about………….just locals going about their daily life. Mid-morning I walked the 5 km down to the beach passing through the rice fields along the way. All the tourists were cycling to the beach…………for me I would rather walk then ride my bike. Rest days are also cycle-free days if I can help it. 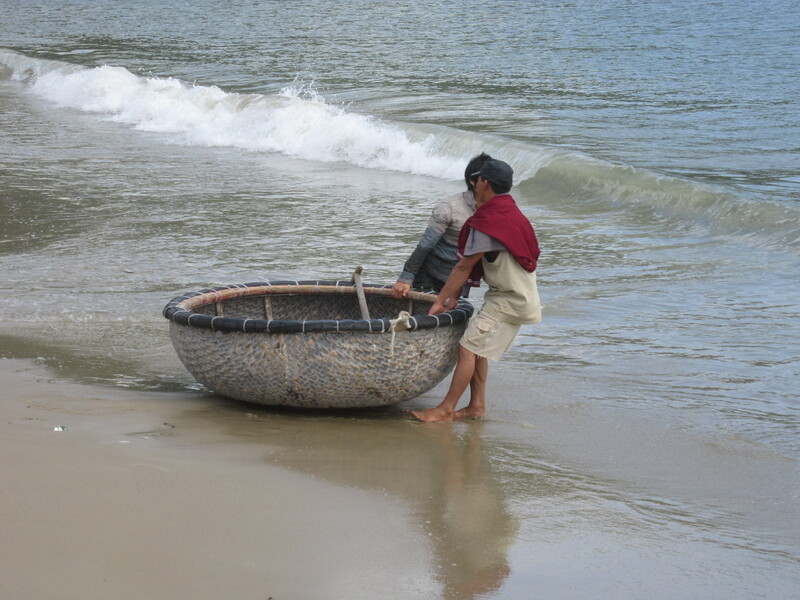 Anyway it was interesting just watching the locals at work and an old guy putting out his fishing net. The beach was nice and the water was warm……………..but I didn’t venture past my ankles. It was just a shame because there was a lot of rubbish about. After lying in the shade beside a small boat I walked the 5 km back to town. It was a hot sunny day and I ended up getting a bit of sun. Not used to it I ended up getting a bit burnt and feeling a bit sore. Dinner time I treated myself to some good Western food at Cargo……..I had a lovely chicken and spinach pie, followed by some chocolate cheesecake and an early night. My next destination is Nah Trang. Some 560 km down the coast and at least 4 or 5 days away. It was a good day’s cycling. Making good progress on the QL1. It seems to run about 15 km parallel to the coast. 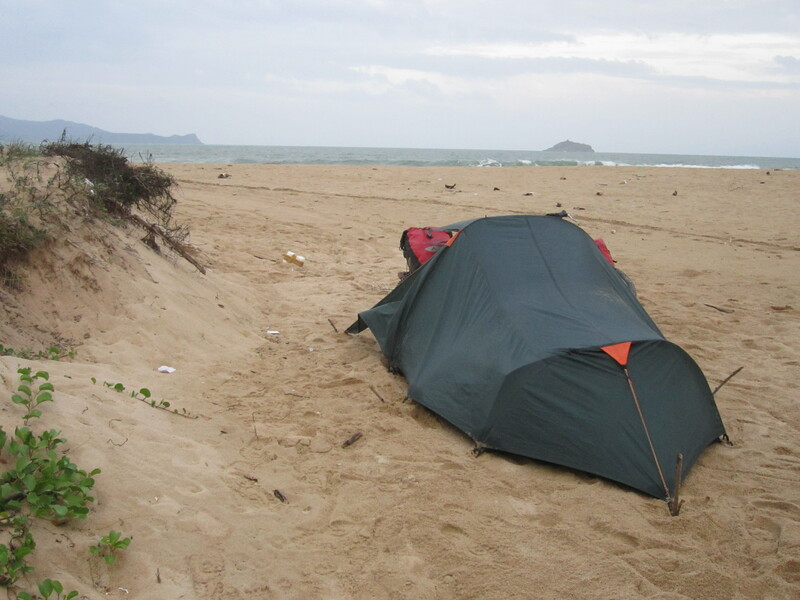 I wanted to camp on the beach so after a big feed I diverted 15 km off the main road. It was raining a bit but not cold. When I got to the beach they were selling BBQ corn………..10 000. I said I wouldn’t pay more then 6 000. My negociating skills are better than I thought because she then gave it to me for 5000 dong. 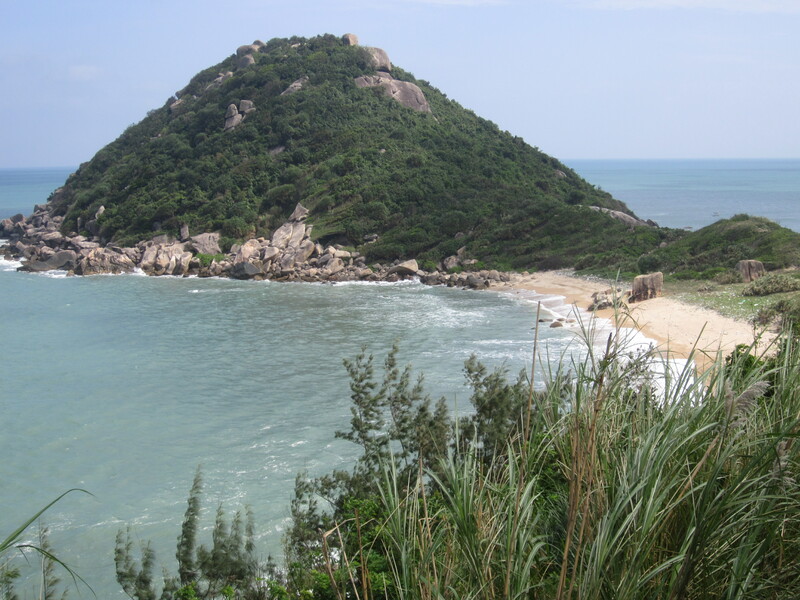 I then went 500 metres up the road to get away from all the hotels and restaurants……….pulled off the road and I camped on the beach at My Lai…………..known for a massacre that occurred in 1968. Three young kids found me I could keep hearing: Hello! Hello! and turned to see nothing. I finally spotted them hiding in the bushes. They eventually came closer and closer till they finally got the courage to come up and have a look at the tent and bike. It was a warm evening and I sat out of the tent writing my blog with my shirt off. To sleep I only used my sleep sheet because it was too hot for a sleeping bag. From the tent I could see 100 fishing boats offshore. As soon as it got dark they all became brightly lit. I think they were fishing for squid. I took the tent down this morning in light drizzly rain. The tent went in the bag wet and covered in sand………….can’t wait to get that out again! The last thing I wanted to find was another flat tyre I pumped it up and though I would find some shelter before changing it………………..funny thing is that it never went down again and 3 days later it is still up. So I guess in the night someone came and let it down. I wonder if it had anything to do with the kids that came round the night before. I ended up having two breakfasts this morning………….just so I could get out of the rain………….though it didn’t matter because I was completely drenched………at least it was still warm. I diverted again off the main road so I could find the beach again. When I got to the coast I was disappointed not to find any sandy beaches but loads of fish farms. So instead of camping on the beach I ended up finding a nice grassy spot in a cemetery just off the road. In the night I woke up and could hear something burrowing underneath the tent. I thought it was going to gnaw its way through the groundsheet. 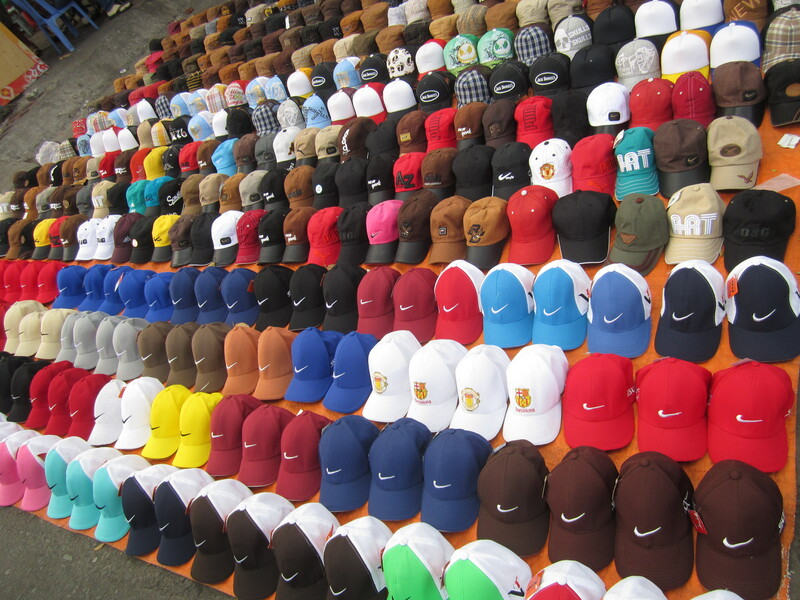 It is surprising how cheap things are when you are out in the country and the locals are not used to tourists. I stopped in a small restaurant for 30 000 dong (£1) I got a bowl of pork and noodles with side-salad and two egg and salad baguettes to take away. 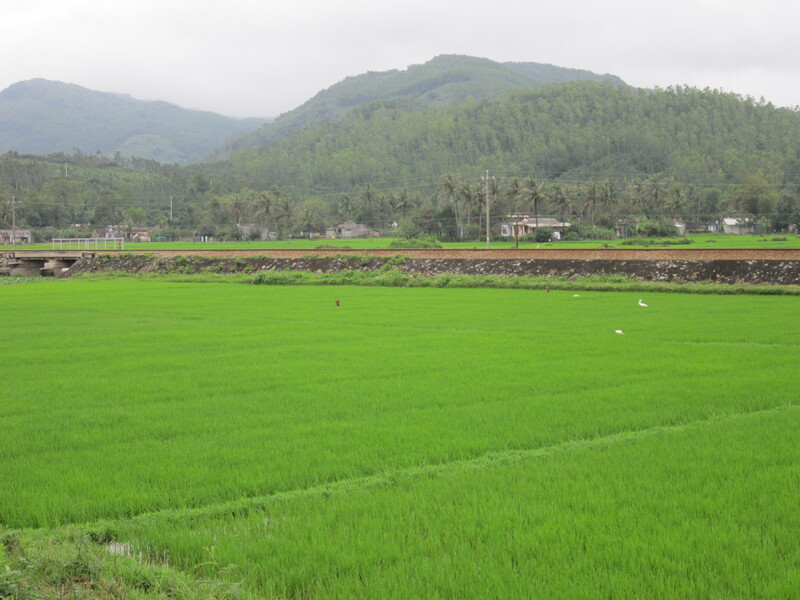 I then took 55 km of back roads passing fish farms, lots of rice fields and little villages. The coast was beautiful with golden sand beaches…………shame I didn’t find this last night. Would have been an awesome camping spot. The sun was out for half an hour and then it got very dark and then it tipped down. I had to seek refuge pretty quick under an abandoned roadside store. After 17000 km I am starting to have problems with my gears…………..The middle front cog is completely worn. So I am running on 18 gears now. The other problem is I can change up but I can’t change down…………It’s time for a major overhaul…………..shame it has come a bit early because I was hoping I would get to Bangkok………………..I’m in a bit of trouble because it is not going to be easy to find the parts. After cycling along a single lane road for so long I was surprised when it turned into a 4-lane highway and went over a massive bridge to Quy Nhan that in any other country it would have been forbidden to cycle over………………It is a sign that the unspoiled coastline is in line for some big development. I stopped for an early dinner of the best fresh spring rolls I have ever had. She was making them right in front of me. I wish I could find good food like this every day. I then cycled a few kms out of town and took the first track I found heading for the beach. 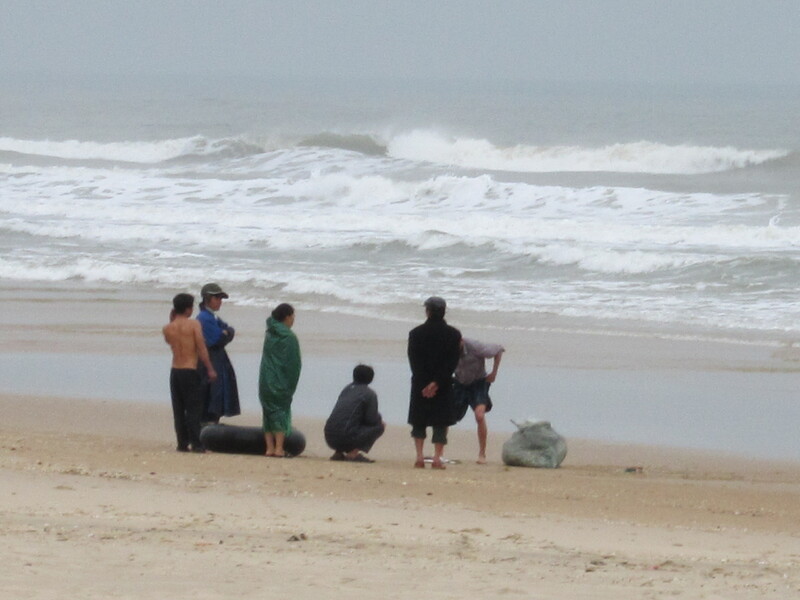 I was up at the crack of dawn and so were some local women who had come down to the beach to do their morning exercise. It wasn’t long before they came over to check out what I was up to. As always it was jokingly suggested I marry and take one of the women with me. I headed South hugging the beautiful coastline. I had a few passes to go over which gave an even better view. Yesterday I lost the middle 9 gears and today it got a whole lot worse when I lost the top 9 gears as well. It is not much fun trying to cycle in just the 9 low gears. But it is better than nothing and at least I am still moving in the right direction. 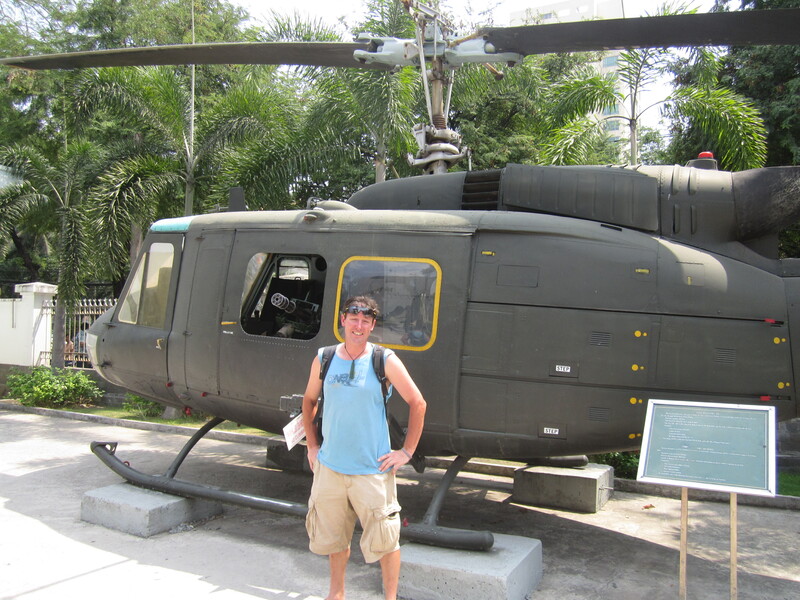 I will limp my way to Saigon…………….but may have to wait till Bangkok to get it sorted. After a little rain mid-morning it turned in to a lovely hot and sunny day. I stopped for lunch in a small fishing village and had lots of time so I had a wander around. The plan tonight is to camp about 50 km from Nha Trang and then have a good run in tomorrow morning so as to have most of the day and save on accommodation tonight. Come 3 p.m. I had done enough and was ready to stop for the day. Was in a built-up area and it was proving difficult to get down to the beach let alone find a spot. In the end I just took a dirt track that led to a dead end. The beach was on one side and a row of houses on the other. I camped on the beach side just 10 meters from someone’s front gate. I did ask and it wasn’t a problem. I had to move my tent slightly when I realized I had put it under a coconut tree and would be in the firing line if they started dropping. It was a nice little quiet spot well-sheltered and a nice view looking into the bay. Lots of fishing boats. It was a nice evening………..still very warm. I made the mistake of sleeping with the tent door open and ended up getting quite a few bites…………..one of the down sides with the warm weather. It was painful cycling into Nha Trang with so many gears missing. But I made good time and was checked into a hostel by 10:30 a.m. and straight in for a much needed shower. After 4 days, sweat, sand and dirt is not a nice combination. In 4 days I spent about £10 on food only. Now I am in the very touristic Nha Trang. The money will just disappear. The cost of my burger for lunch is the same as a whole day of meals on the road. Lunch, washing laundry and walked to supermarket to restock. Stopped for another shave on street. Noticed there were a lot of tourists around………..They seem to be predominantly Russian…..they are everywhere……………even in parts of Nha Trang the shop signs are in Russian. Day 308: It seems to be Christmas all year round in Vietnam………come February I am still seeing Father Christmas, Christmas trees and decorations in some of the shops and hotels. I’m feeling a bit down because my bike is not running very well and don’t fancy the 1500 km ride to Bangkok to get it fixed. I spent a good few hours on the internet looking at solutions. Day 309: I went to the bike shop to see if there was any hope of getting what I needed. What a waste of time that was. Absolutely useless……….Though in the afternoon I had a lift when I got some good news to a question I posted on the Lonely Planet forum and discovered surprisingly there are some half decent bike shops in Saigon. I rang one up and they seem to have what I need so I won’t have to cycle as far as I thought on a dodgy bike. I feel a lot better now. I also cleaned my bike ready for tomorrow and thought I’d better see the beach before I leave. So I went for a nice long walk along the beach. Considering it is winter it is very summery here. Sunny 31 degrees……………it is awesome. I was supposed to leave this morning. But I’m not going to because the hostel has talked me into staying another night with the offer of a free tour and in return I give them a hand to design a brochure and be in a bit of a photo shoot. Not a bad deal. 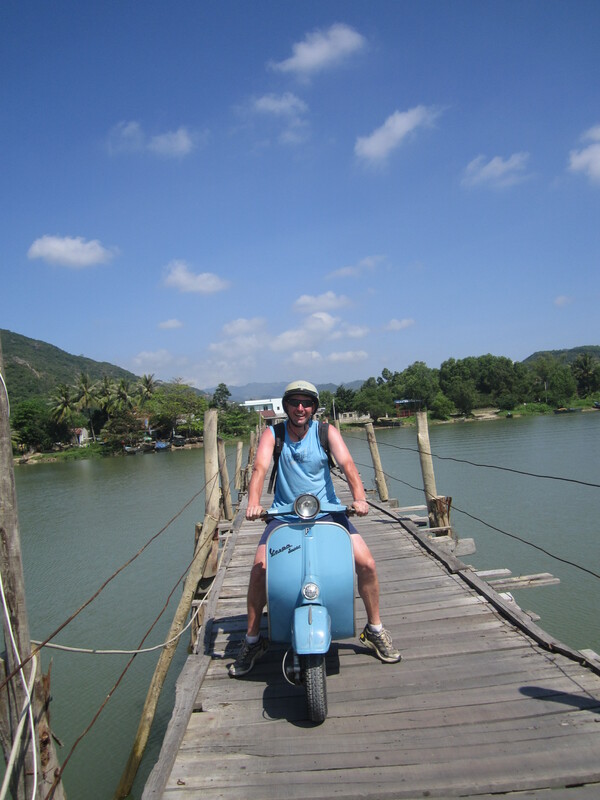 We did the city tour which was riding round Nha Trang on an Italian Vespa visiting sights. Normally you have a driver…….but there weren’t enough so I had to drive myself………..not used to it at all. Was a little scary with all the crazy traffic. It was a good half day tour with a free lunch. In the afternoon I went and had some beach time. Couple of hours was enough for me and I then went and found the local market. Just a bit smelly with all the meat and fish. Went with a couple of the girls from the hostel Dianna and Ashaney for some cheap street food. Pork chops, egg rice, vegetables and a soup all for a £1. Finished this off by going for a walk along the beach. Loads of locals were down having picnics. where we could swim and just as well because it was hot sunny and 31 degrees again. Another free lunch and then we went and saw some pig racing before heading home. 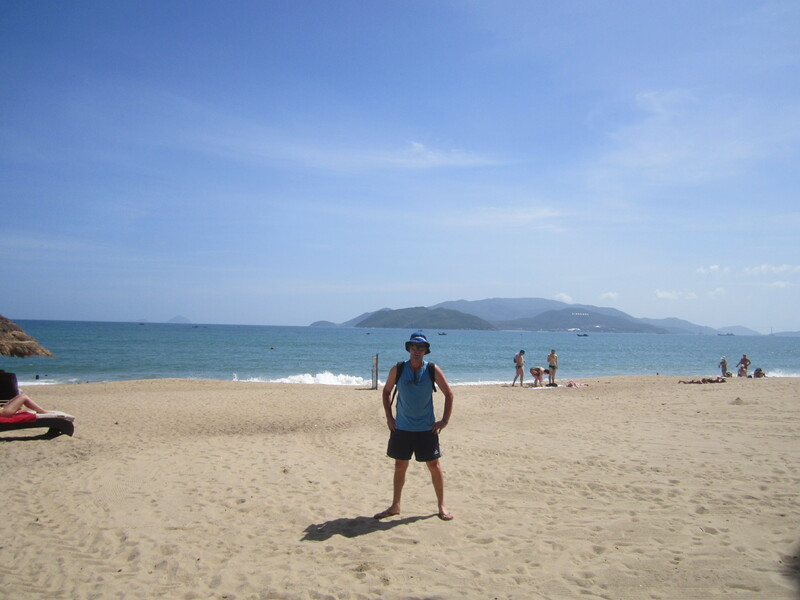 The street food in Nha Trang is the best so far………..so it was same again and another walk on the beach. Lots of picnics and students playing games. 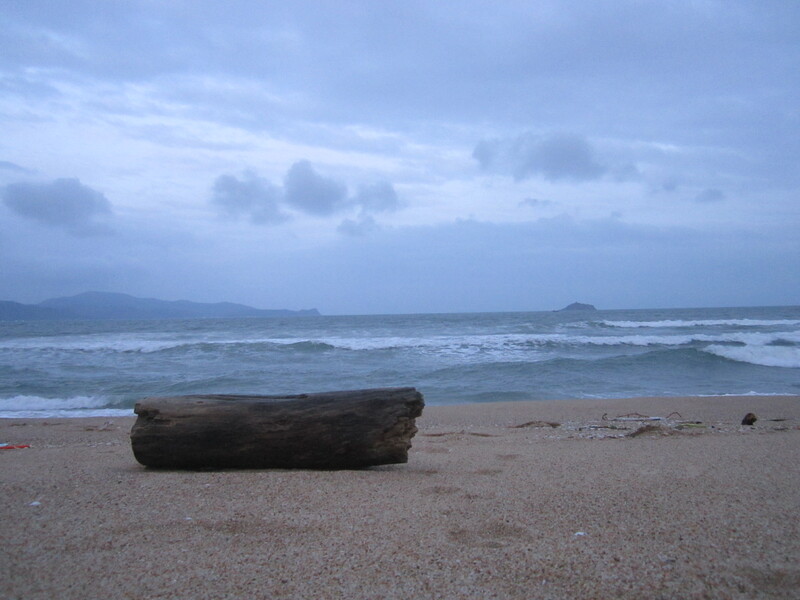 Day 312 : Last day in Nha Trang for sure. After yesterday’s big day on the Vespa, I needed a quiet day before heading off. It is stinking hot again 31 degrees, hot and sunny. Have been helping with the brochure and discovered I have a solo appearance on the back. 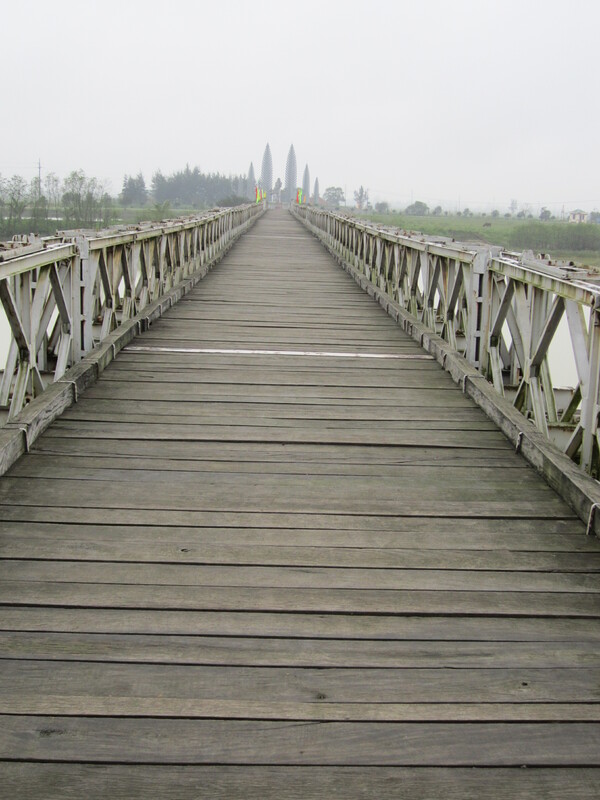 It is actually a really nice photo coming across the wooden bridge. Asked if I wanted coffee……….it was delivered by some guy on a bike 5 mins later. It was another awesome day cycling down the beautiful Vietnam coastline. The sun was out and the water was sparkling which just added to the enjoyment When you least expect it, you come across something really awesome like a 1300 old Cham tower. Come 3 p.m. I saw some sandy beach breaking up the coastline. I passed an old resort that was just in ruins and took an overgrown concrete road down to the beach. Here I set my tent up under some trees…………..but still in the sun. It was such a hot day. I didn’t bother putting the fly on the tent. It turned out to be a popular spot. Firstly half a dozen guys on their bikes came down for a swim. They were friendly and didn’t bother me then soon after a group of teenagers also came down for a swim. I took some photos of the sunset and watched the fishermen in their little round boats fishing just offshore. I had a bit of a sleepless night. 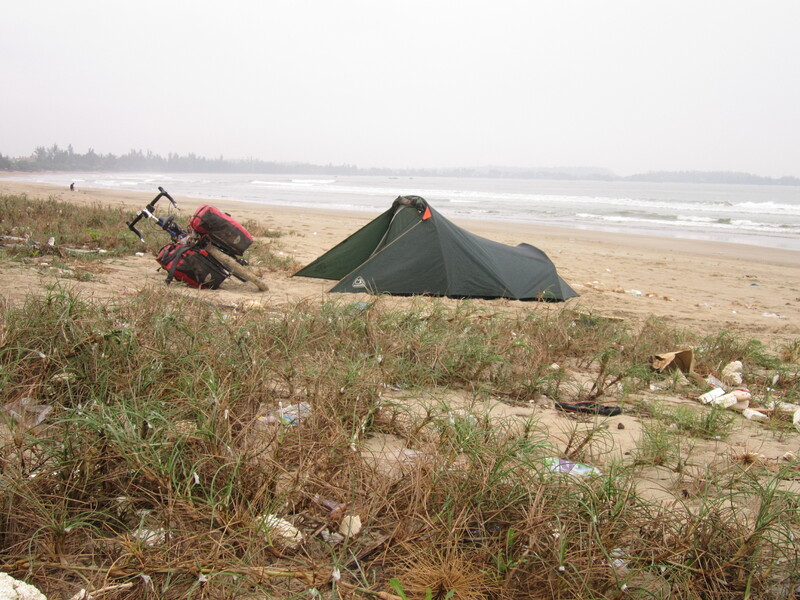 It was so windy on the beach and my tent took a real battering. I watched the sun rise and then continued my journey south. I did 20 km before stopping at a small roadside restaurant for some breakfast. Went to leave and discovered I had another flat………….so I had to fix that before moving on. At 8 o’clock in the morning it was already very hot. After months of winter it is back to putting on sunscreen and drinking lots of water. In the last few days quite often there has been a strong fishy smell. Along the side of the road thousands of fish are put out to dry in the hot sun. It’s a bit sickly sometimes the fish are even on the road and you need to cycle round them. 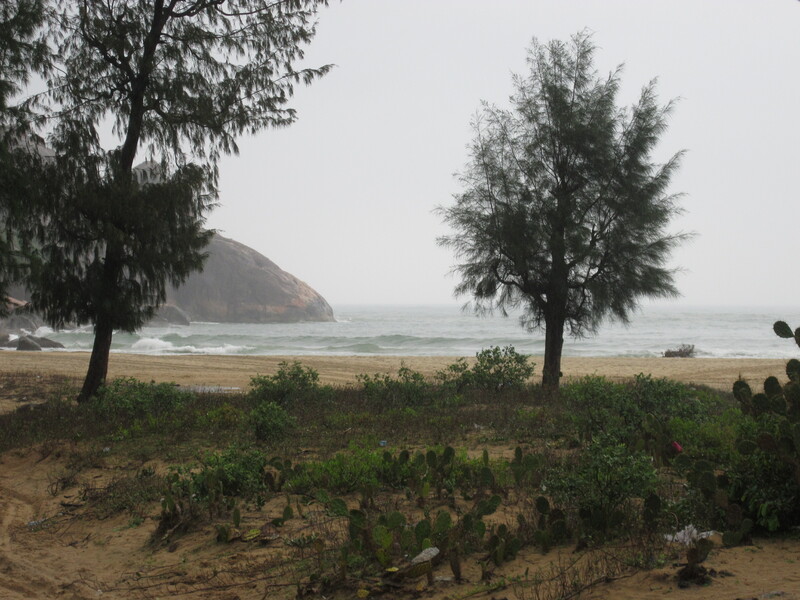 I had to cycle 10 km off the main road to get to Mui Ne……………tiny and less developed compared to Nha Trang. But loads of beach resorts. 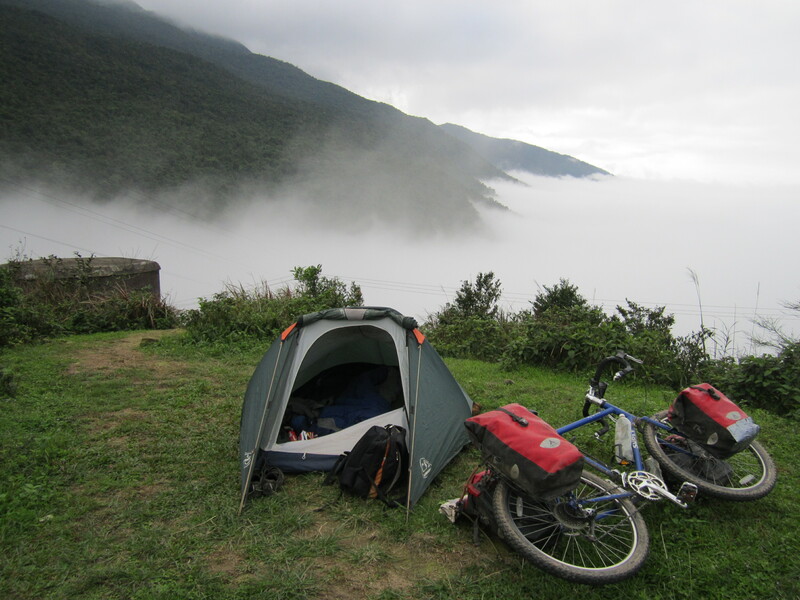 I could have put up the tent again……………however after two days of cycling and covered in sweat and dust I didn’t mind paying for a hotel. Hotels started at $15 a night in the centre of town. So I moved to the outskirts and got a room for $7.50 which in the end was good because everything is a lot quieter. I’m having one more day at the beach before heading inland tomorrow. It will be a good few weeks before I see the beach again. 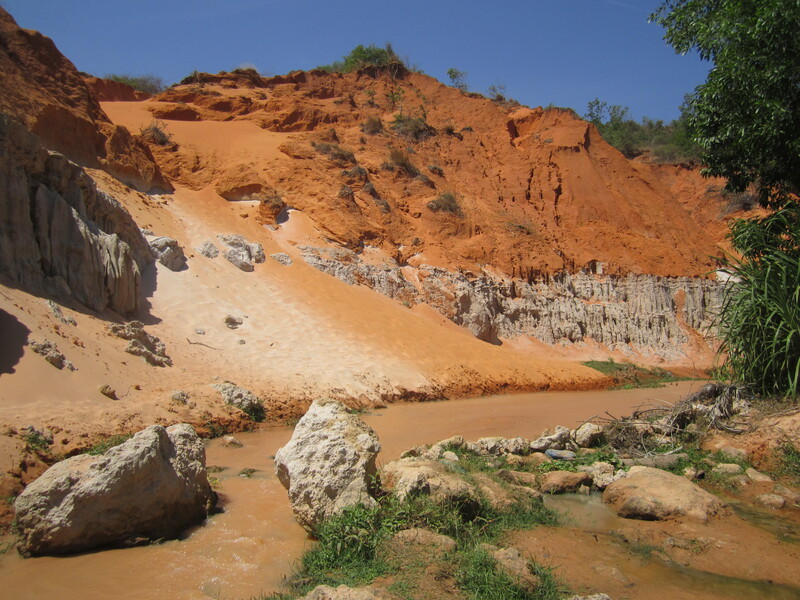 But before I went to the beach I went to the fairy spring which is a small stream that runs through the red sand dunes. 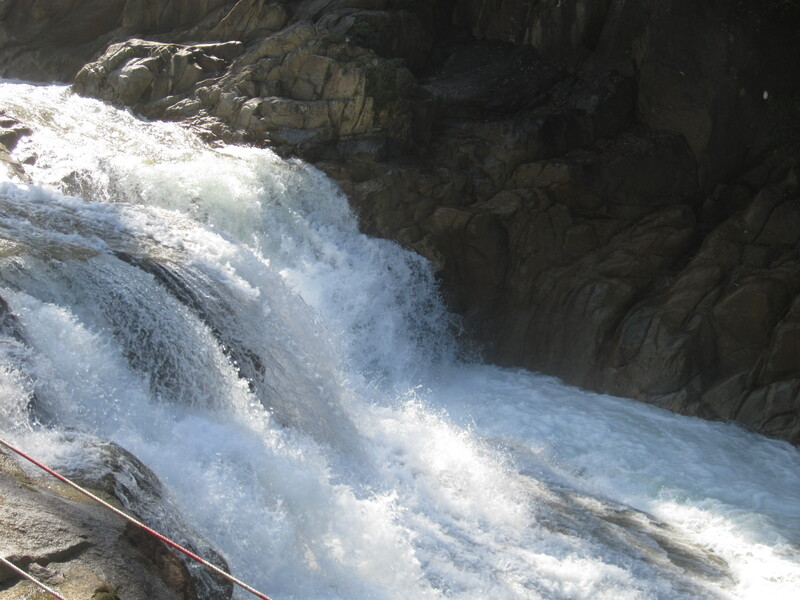 I followed the stream for 2 km up to a waterfall. I then walked back to the beach where I wandered along. It was very quiet which was nice and the other good thing is that even with lots of resorts you can still walk along the beach with no problem. 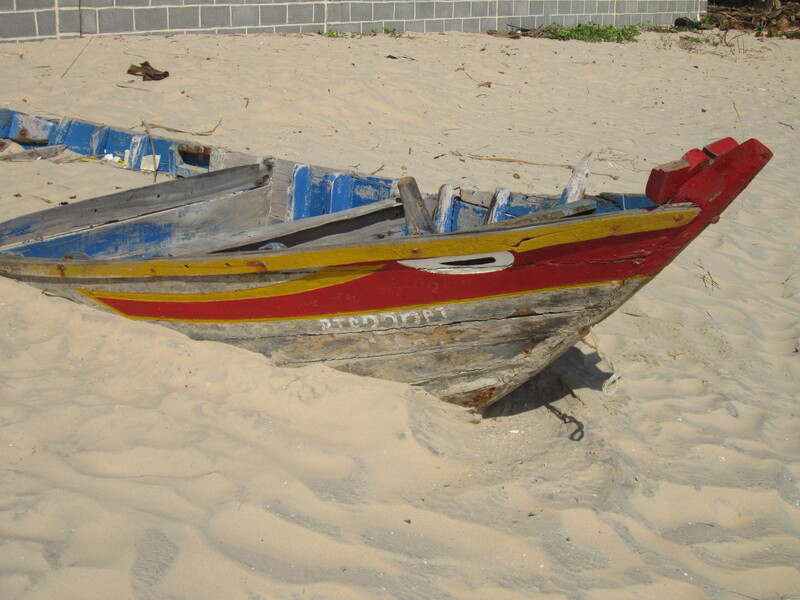 I watched 3 lots of fishermen pull their nets onto the beach…………………..they didn’t get many and they weren’t very big either. I walked a good few km along the beach before a late lunch and a bit of a rest. It was a little sad leaving the beach and the coast behind this morning. The past few weeks I have really enjoyed camping and cycling with the ocean in sight. Not to mention those days of just lying on the beach doing nothing. Come midday I had done just under 100 km………..I had been cycling pretty hard and had worked up a good sweat. It was pretty tiring cycling in 34 degrees heat. I felt exhausted………..I polished off a 1.5 l bottle of iced tea in pretty quick time and then had a nap in one of the restaurant hammocks. Two hours later I thought I had better get moving again…………it was difficult. I haven’t see much aggression at all in Vietnam. Earlier in the day during my morning tea stop two female roadside sellers had a war of words before one of them was ambushed when she went to walk away and then it was all on. I picked up the pace again and could have gone all the way to Saigon if I had a few more hours of sunlight. I kept seeing some good places to camp in the large rubber plantations……………in the end I went too far because the rubber plantations suddenly disappeared and it became completely built up and there was nowhere to camp………………so I had to grab a hotel. I thought I had planned it well cycling into Saigon on a Sunday morning………From the moment I left the hotel just before 7 a.m. the traffic was manic. I couldn’t believe how busy it was. 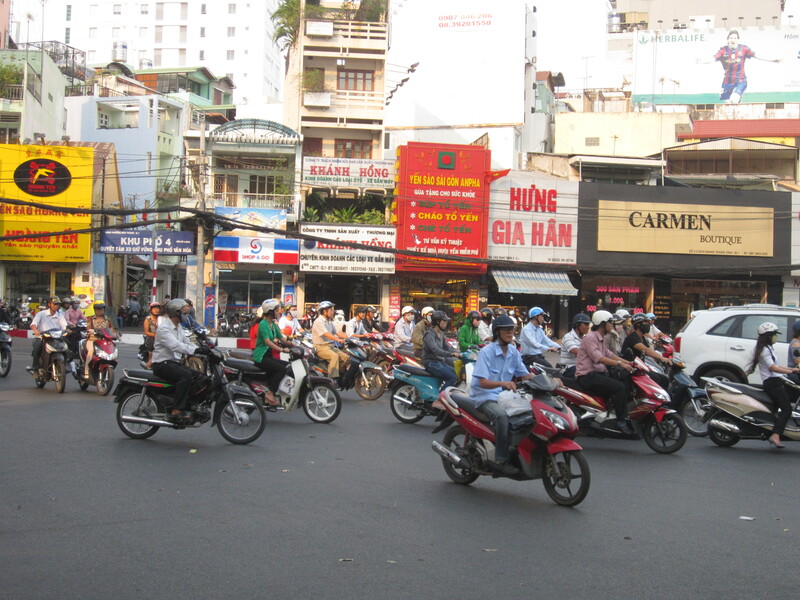 It was a stressful few hours cycling the 50 km into the centre of Saigon. The closer I got the worse it got. Everybody was dressed up and going to church. With some help from the locals it wasn’t too hard to navigate in district 1 and Backers central. The difficult part was trying to find a cheap room. All were $15 plus. In the end after trawling the back alleys for one hour I settled for a dorm room in a hostel for $8. More than what I paid for a hotel room for myself the night before. Not a sign indicating the pricing system in Saigon. It is not a bad room on the 5th floor. Very clean and quiet. The view is interesting…….as you are able to look down onto the roofs of many of the buildings below with their pretty little gardens or clutter of rubbish. I didn’t feel like it at all but it was pretty important that I got my bike to the bike shop for its major overhaul as soon as possible…………………and it will be a peace of mind to have it running smoothly again. I just didn’t fancy the 9 km cycle across town. 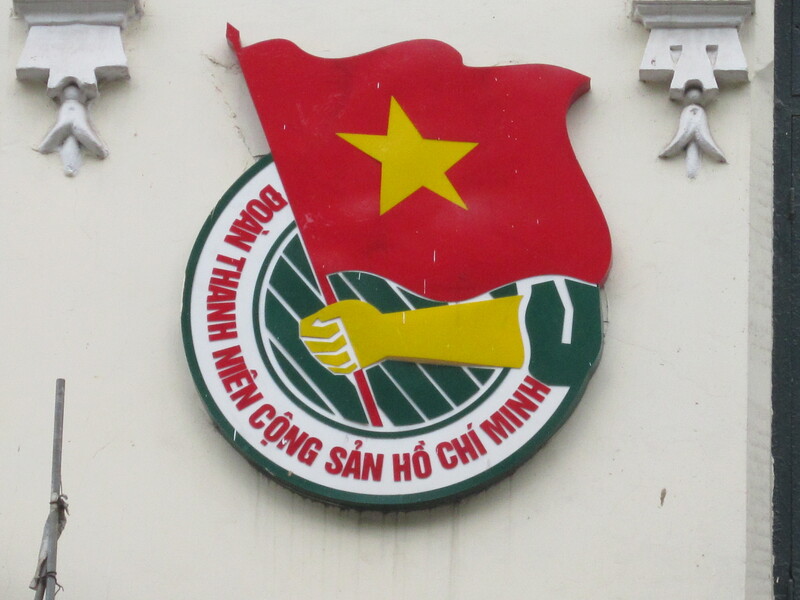 The bike shop was a welcome sight…………for Vietnam I was very surprised. It was very well kitted out. They even stocked my exact bike…………..so if I wanted to I could buy a new one. The owner turned out to be an Australian expat and we got talking. I left with a new Tee Shirt and confident that my bike had been left in good hands. My couch surfing friend from Hue, Lan has a friend here Tien who came and picked me up and took me out on a scooter for some dinner and a few sights. You can get your Cambodian visa on the border……….but I decided it might be easier to get the visa here after starting to hear some horror stories of people travelling on their own and taking hours to get through. So the first stop of the day was the Cambodian Embassy. The visa was simple………..applied in the morning and picked it up in the afternoon. I wish they were all like that. I joined Cecilia., a Chinese Canadian girl I had met in the hostel. 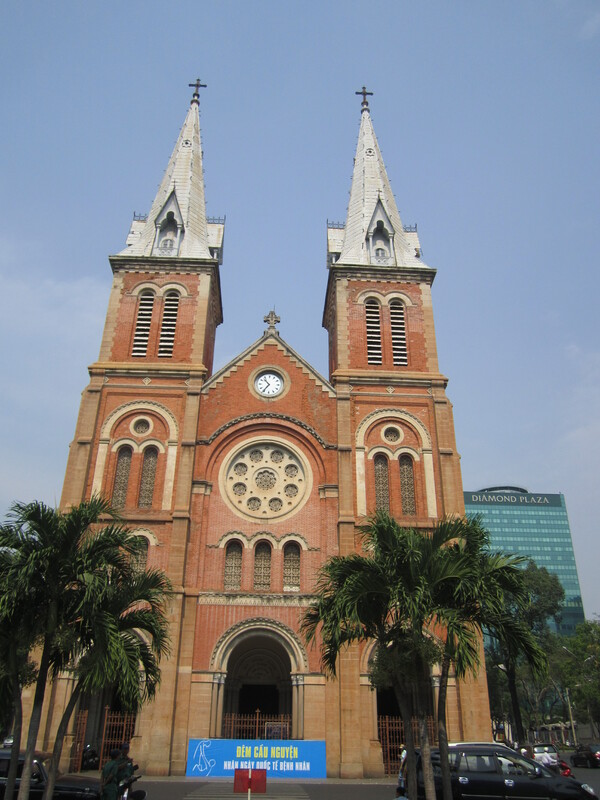 We did a bit of a walking tour visiting the very grand looking old Post office, Notre Dame Cathedral left over from French colonial times and the war museum which documented the French and the Vietnam war. I am always a bit nervous when I am on the back of a scooter, especially in Saigon. there is so much traffic coming and going from every direction. Tien picked me up again to take me shopping…………….After 10 months, it is time to get rid of my old rags……..unfortunately Vietnamese style has little to be desired. They have no plain or simple Tee Shirts. Everything is loud or has silly pictures. Hence we came away empty handed and I think Tien thinks I am too fussy. This morning I went and picked up my bike from the bike shop………………I was just beaming when I saw it. It looked like a new bike…………they had completely striped it, cleaned everything and replaced everything that was worn like brakes, brake cables, gear cables, chain and all the gears which were the main problem. They even painted the tyres and polished the bike. I am super pleased and think I have been very lucky. The cost was cheap. What they charged me wouldn’t even cover the cost of half the parts if I had had the work done in London. In the afternoon I went for a £2 blind massage which was good. 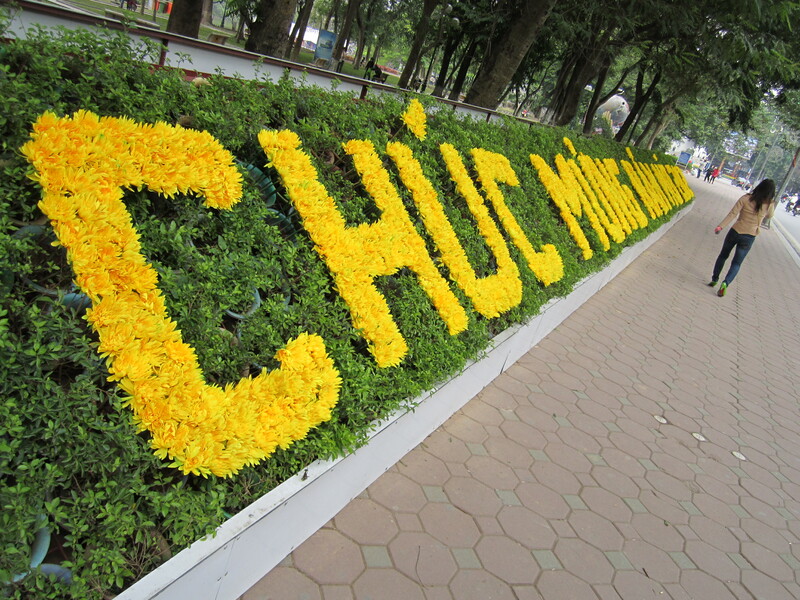 Even in Vietnam they celebrate Valentine’s day. I wasn’t alone because I arranged to have dinner with Elodie, a French Canadian girl from the hostel at the broken rice restaurant. 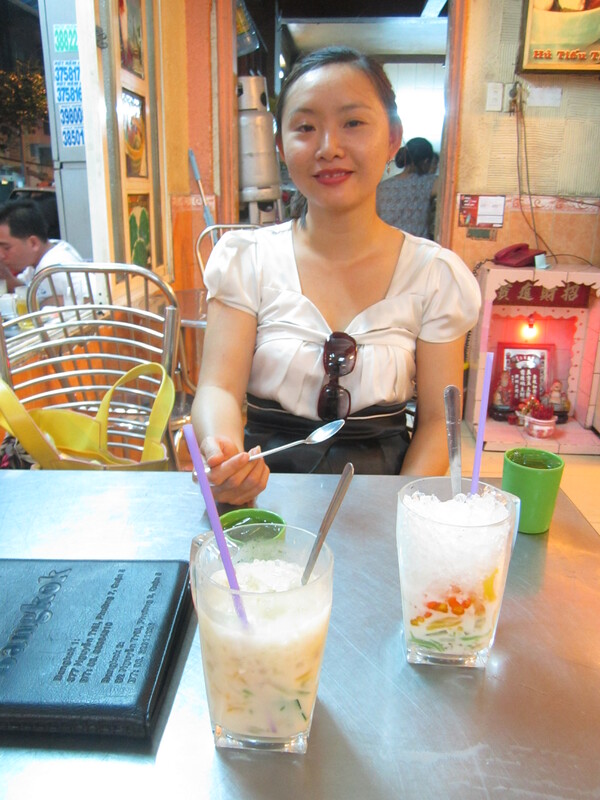 Afterwards I meet up again with Tien for a second dinner and then some desert at the ice-cream shop. I had coconut and green bean ice-cream because of Valentine’s day the streets were packed. Two days ago I got a surprise phone call when Nga a local journalist called asking for an interview. So this morning I meet Nga who writes for a national newspaper for a few hours. Leaving the coffee shop and looking lost. Kazue (Japanese expat) who runs a foot massage and jewellry shop came to my aid. I always tell people about my trip and they are just amazed. One of her clients from the UK gave me a bag of nuts and an orange and Kazue gave me a small good luck charm for my travels. I have been so lucky with the continuing generosity I receive. With my last day in Saigon I thought I’d better make the most of it and go out and do something constructive. Plan was to walk up to the History museum. Along the way I stopped off in a few parks, the Revolution museum and a little along the river to take some photos. I saw some illegal street side vendors being evicted. The police came along and confiscated all their goods. There was some heated exchanges. Again I have seen dog meat for sale. Came across the unpleasant sight of a dog on a spit. When I reached the History museum it was closed for lunch. 11:00 a.m. – 1:30 p.m. Didn’t bother waiting the 2 hours for it to reopen and started walking to the area with all the temples. The humidity was high and it was hard work walking in the heat of the day. It was a long walk to the temples. At least they were open. They were full of burning incense. Got back to the hostel at 5 p.m. and discovered I had to move after 4 days because the hostel was fully booked. The hostel just took me to the hotel next door and I just left my bike all my stuff in the first hostel to save the hassle of moving it all for just one night. The border is 80 km away and I need to be over it by the end of tomorrow when my visa expires. We went for coffee and afterwards for some brunch. It was midday when I finally started cycling out of Saigon………….Wasn’t really in the mood for it……….and the thought of heading round to the immigration office for another visa extension was very tempting. Cycling out of Saigon was just as busy as cycling in. I got out of the city which was half the battle of getting to the border and I called it a day after just 22 km……….good call because shortly after there was torrential rain with thunder and lightning. For some reason I’m just not in any hurry to leave Vietnam. I procrastinated till 11 a.m. this morning before making a run for the border. In the end it was only 3 hours. I stopped and spent all my dong. I cycled 2 km from the border and grabbed a hotel. There was a two hour power cut in the evening. I hope it is not going to be a common occurrence in Cambodia. I couldn’t stay in the room because it was too dark and too hot. This is the outcome from my interview with Nga. 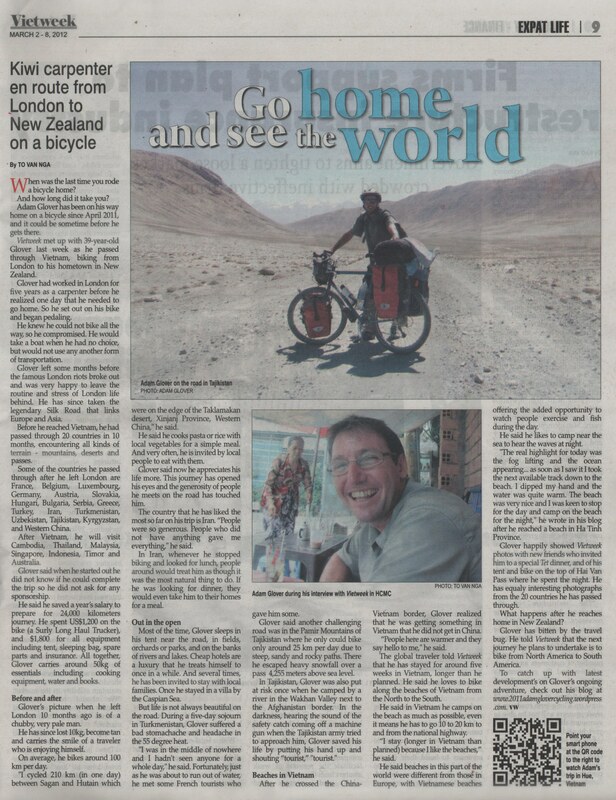 This article appeared in a Vietnamese newspaper only a few weeks after leaving Vietnam. Journalists have a way with words. What I said and what appeared was not completely correct. Here is the online link to the article. Hi Adam, I wish you happy New Year and good luck in travelling back home to New Seeland. Since 29.12.2011 I am on the road again and now I am in Savannakhet in Laos, my next destinations are Pakse, Angkor Wat and Bangkok. Good to hear from you. Happy New year. Good news to hear you are back on the bike. If it is not raining. 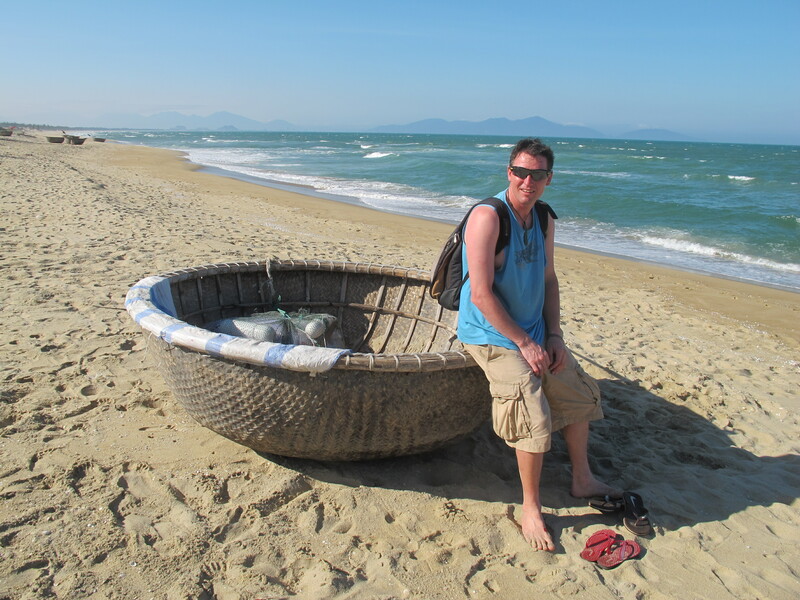 I will leave Hanoi tomorrow heading straight for the coast, Have not seen the ocean for 6 months. Maybe I catch you in Thailand. Hi Adam. 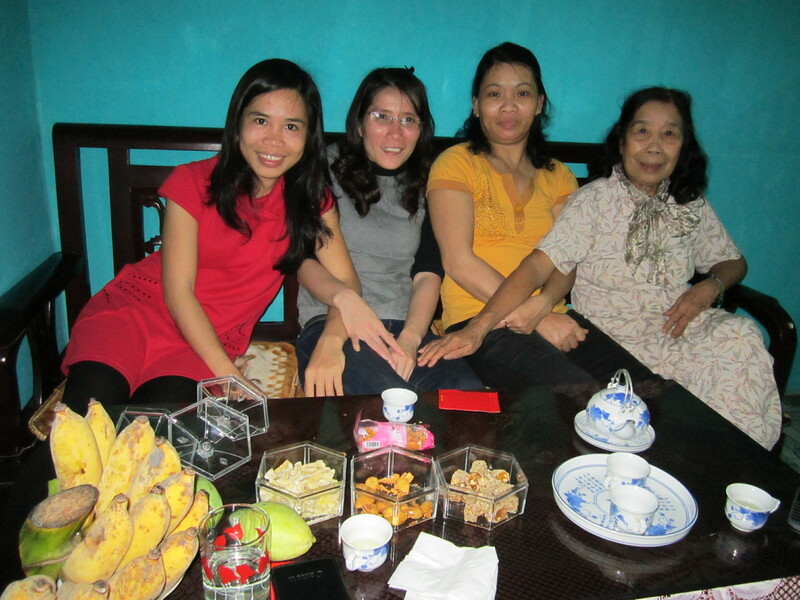 It was great to meet you in Hue. wish you the best and continued travels! We wish all good luck and a safe trip back home. thank you so much for your very kind words of encouragement. I feel very humble and they are very much appreciated. They certainly helps me keep going. I am very happy to read these paragraph of yours , you are the stuff man, and very love travelling .Good lucky to your journey.